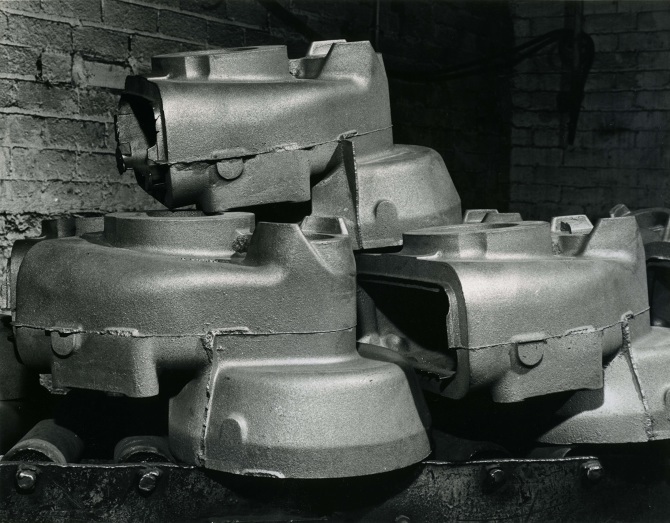 1961 Iron founders, manufacturers of general engineering and automobile castings, stoves, cookers, rain water and soil pipes, builders castings. 350 employees. 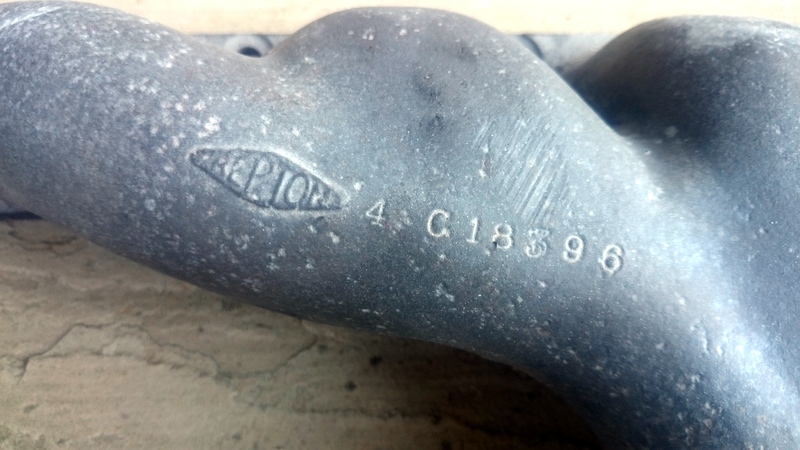 The original cast manifolds were marked with the 'Repton' logo and were embossed with the part number and casting date. They weigh 9.4 lbs each without the studs. 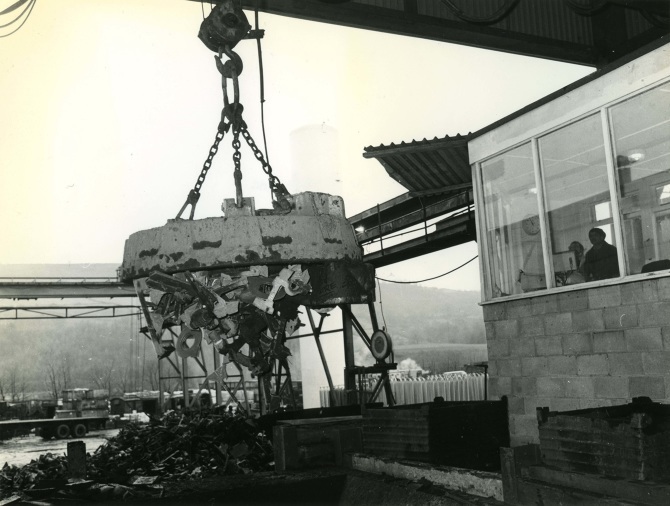 The process started by melting new and scrap metal in furnances so it could be poured into the moulds. 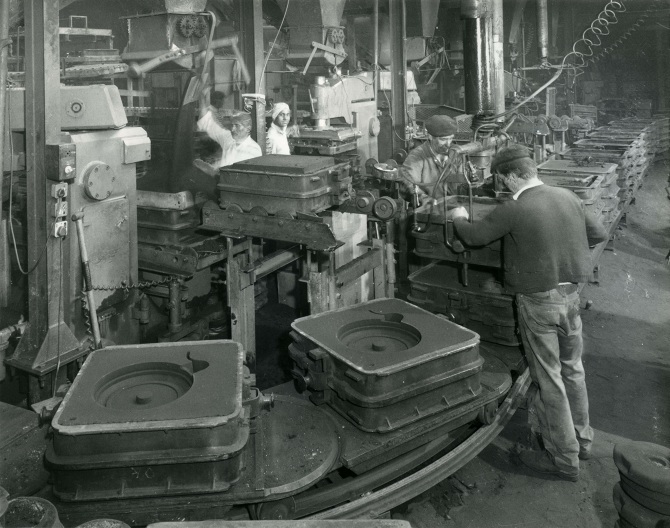 The moulds were cast in sand with cores added for the voids within. 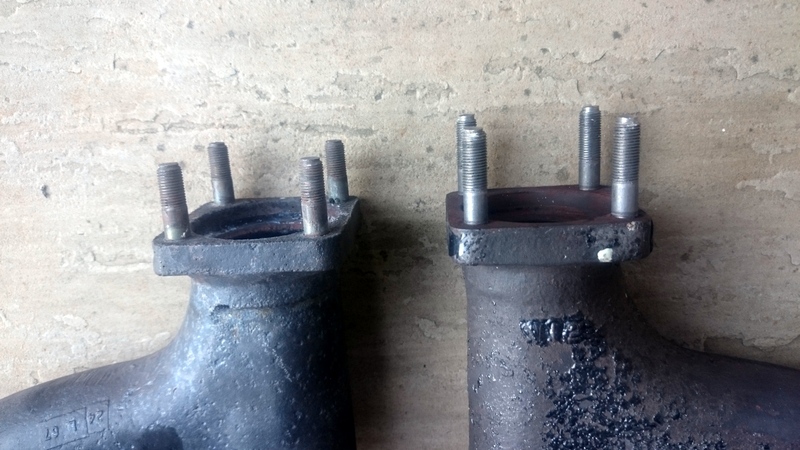 After cooling the manifolds were taken from the sand cast and the cores removed, usually sacrificially. 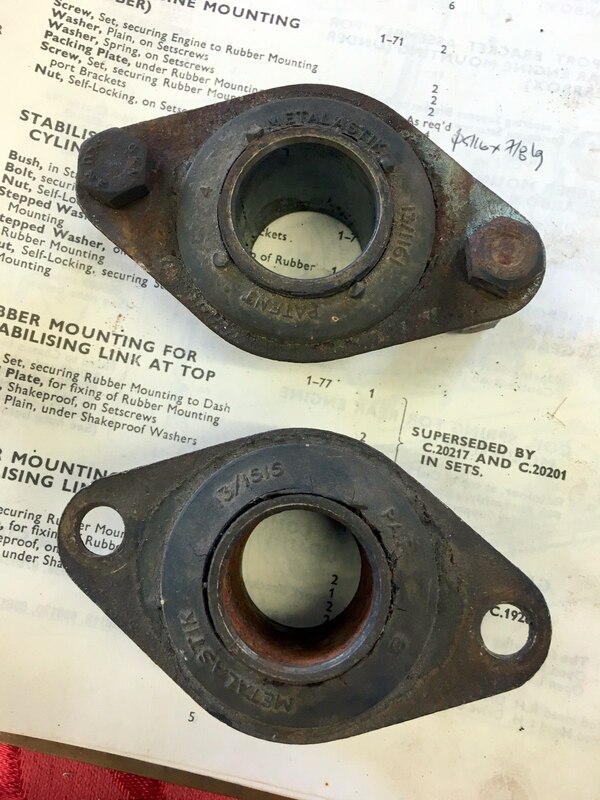 The manifolds were sent for blasting and cleaning and then to the machine shop where the faces and threaded holes were created. 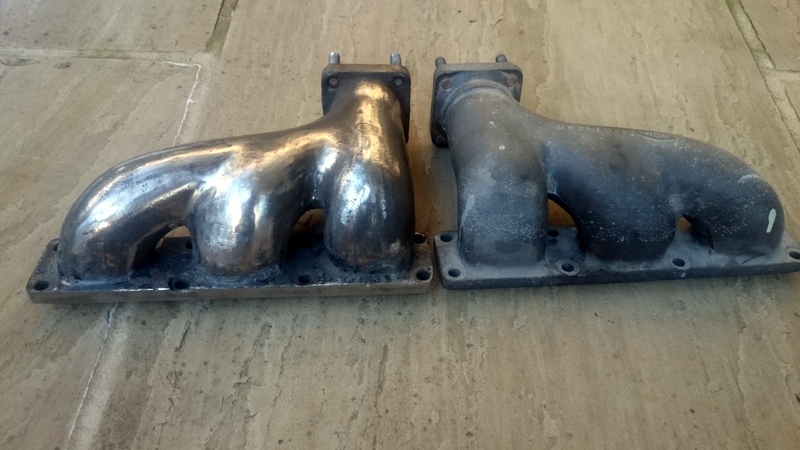 After the iron manifolds were ready a glass particulate called "frit" (a mixture of clay and glass actually) was applied in high gloss black. This was baked on between 650ºC and 750ºC causing the frit to transform into a smooth porcelain surface that is bonded to the iron. The application of industrial porcelain enamel can be a complicated process involving many different and very technical steps. All enamelling processes involve the mixture and preparation of frit, the preparation of the substrate, the application/firing and then finishing processes. Most modern applications also involve two layers of enamel: a ground-coat to bond to the substrate and a cover-coat to provide the desired external properties. Because frits frequently must be mixed and smelted at higher temperatures than the firing requires, most modern industrial enamellers do not mix their own frits completely; frit is most often purchased from dedicated frit producers in standard compositions and then any special ingredients added before application and firing. The porcelain (also known as vitreous enamel) finish is hard, but can be chipped if banged or dropped. 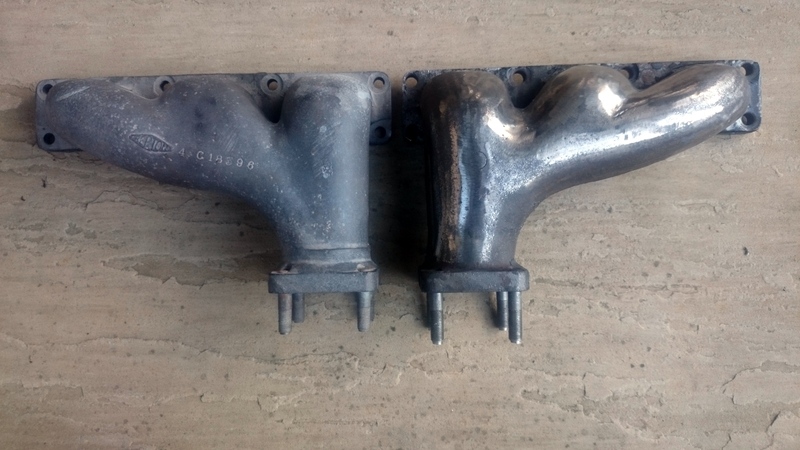 We do not know for sure if Repton Ltd applied the finish to the manifolds but it is most likely they did. 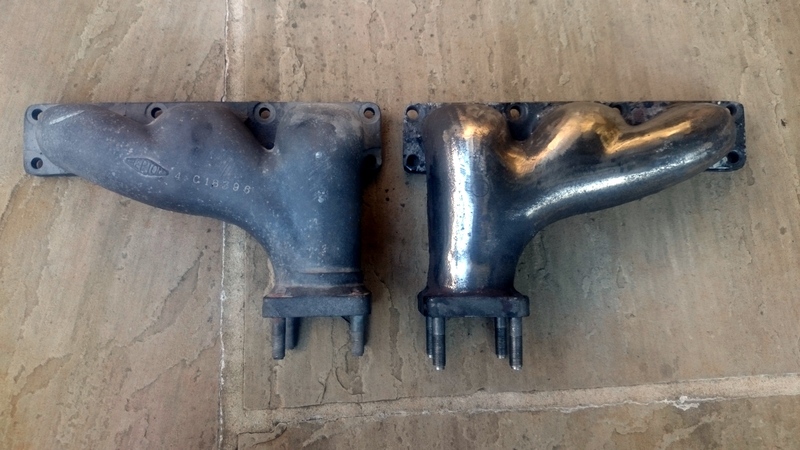 Restoration of the cast iron manifolds is difficult if the original gloss black finish is required. 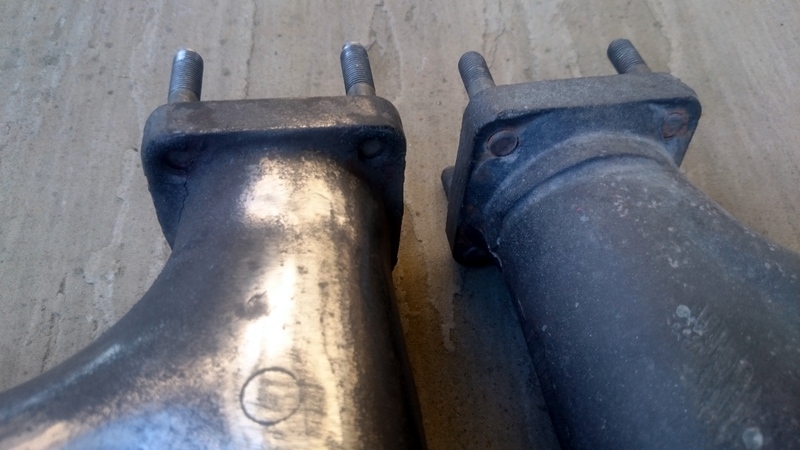 There are companies that add vitreous enamel coating to cookware and stoves but they are reluctant to re-coat exhaust manifolds as they say it will not stand the high temperature cycles in operational use. 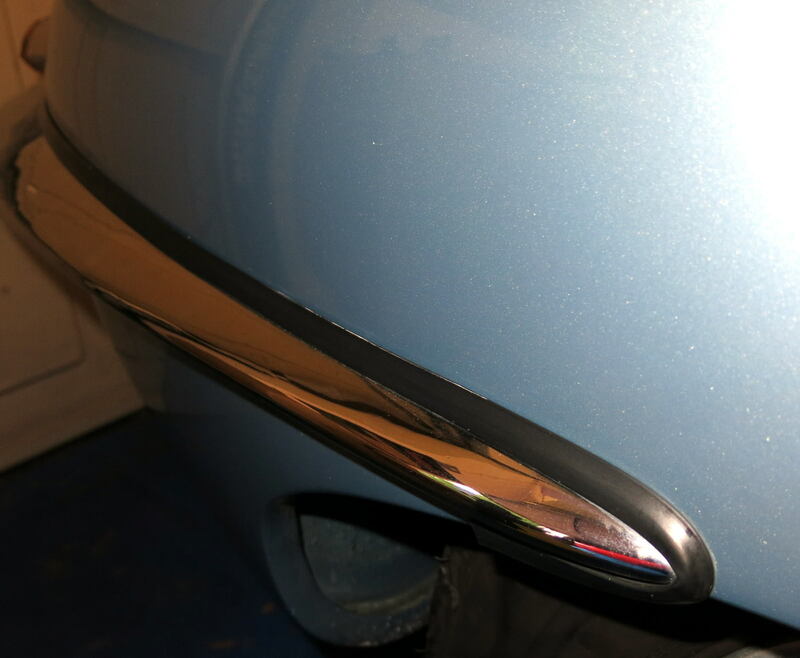 Even specialist coatings like Camcoat and Jet Hot cannot be guaranteed to survive long particularly when a high gloss black finish is used. 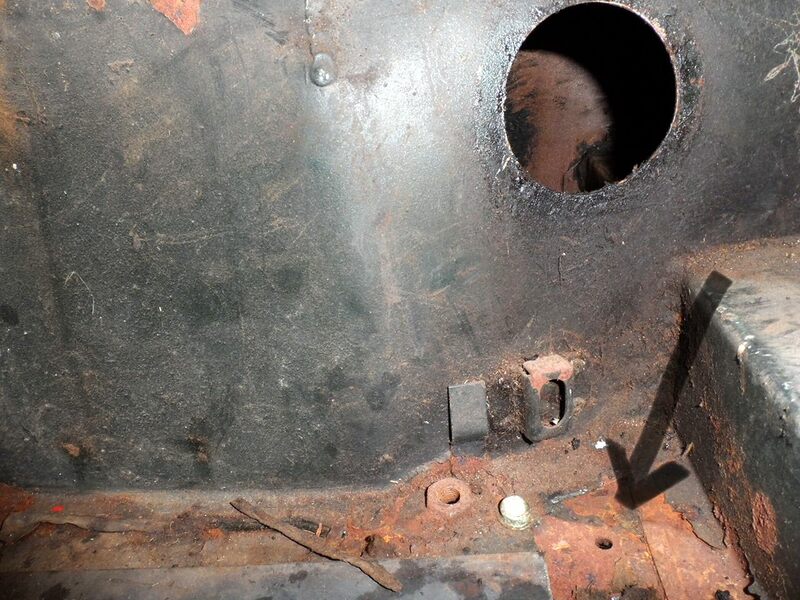 The original Jaguar specified finish only lasted a few thousand miles before it started to craze and flake off. 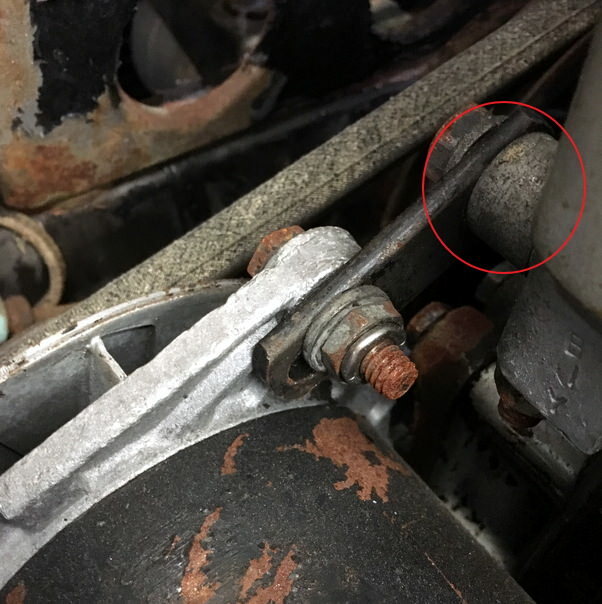 One suggestion is to approach SNGB with your original manifolds and see if they will put them in with their next batch of reproductions although you will need to prepare the surface to meet their standards. For the non-purist BBQ paint is probably the best option as it is cheap and can be easily repainted. 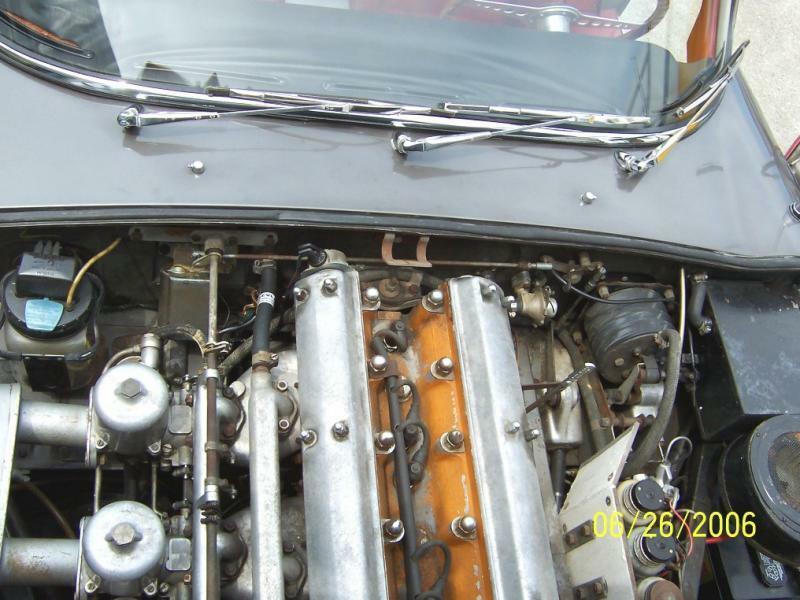 For a concours car the best option is to use reproduction manifolds and not run the engine above 2,500 rpm to avoid crazing. Bear in mind the Repton logo and other markings are usually impossible to make out once the frit has been applied and fired. 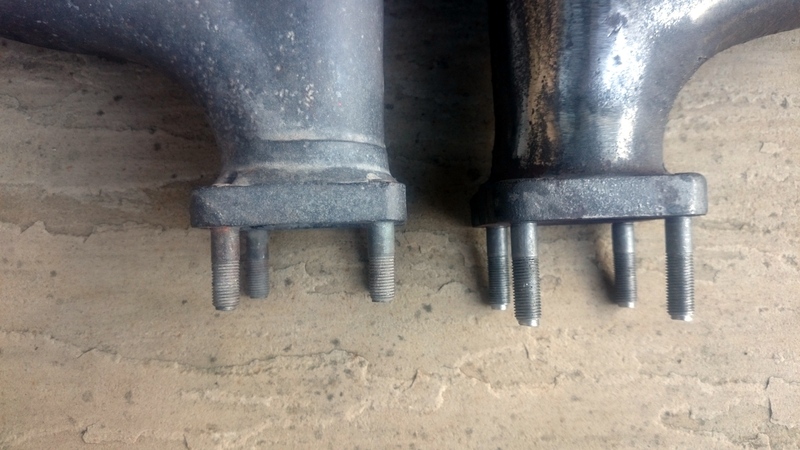 If the manifolds are cracked or broken they can be repaired using oven fusion welding but it is a difficult thing to do and highly specialised. 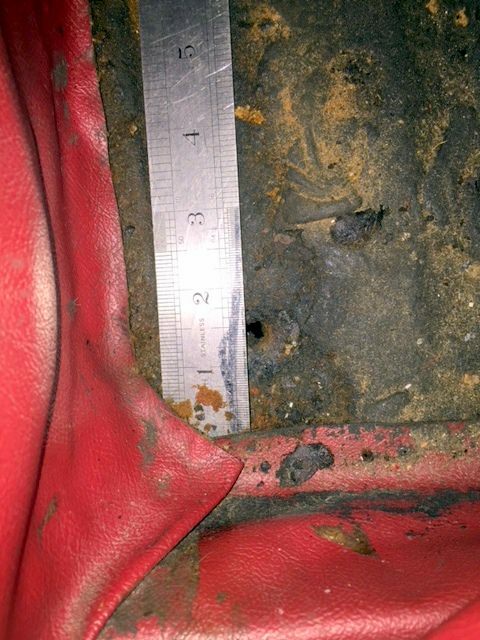 Originals are not that rare so it is more practical to source another rather than repair. Thanks to Simon (288GTO) for the manifold photos. 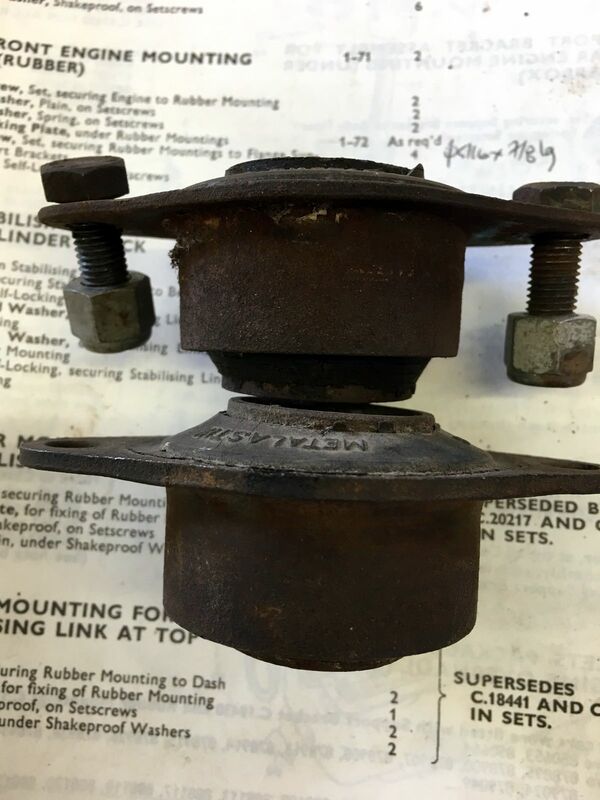 Early cars had rubber pads at the top of the screen pillars BD21098 and BD21099 secured with a self tapping screw. I have no idea when these were discontinued. 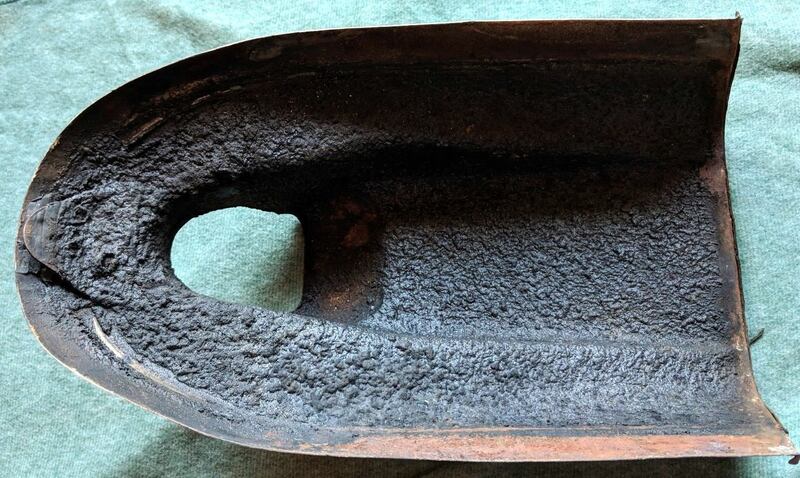 Early cars had a different Metalastic mount C18441. 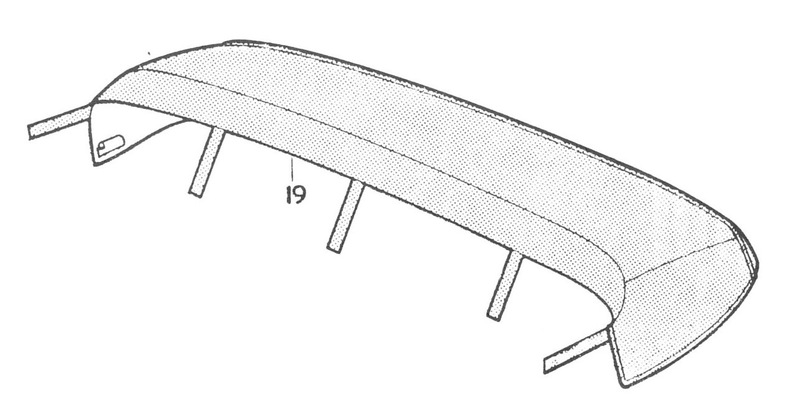 This was superseded by a stronger assembly C20217 for later cars. The tapped plate C19267 was also replaced by C20201. 1860 - Charles Marshall born in Birmingham developed an enduring interest in the production of the puncture-proof tyre while working with Edison. He was inspired by the work of three Austrian brothers, Hans, Fritz, and Herman Pfleumer, who had conceived the original concept of filling tyres with some form of expanded lightweight material, rather than air. 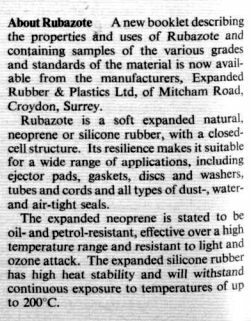 1921 - Marshall, who by this time had devised and patented a process for making both hard (Onazote) and soft (Rubazote) expanded rubber, formed a company called Onazote, based in North London, to exploit his discovery. 1929 - renamed Expanded Rubber Co of Palace of Arts, Wembley. Moved to 675 Mitcham Road, Croydon, Surrey. Telephone: Thornton Heath 3622. 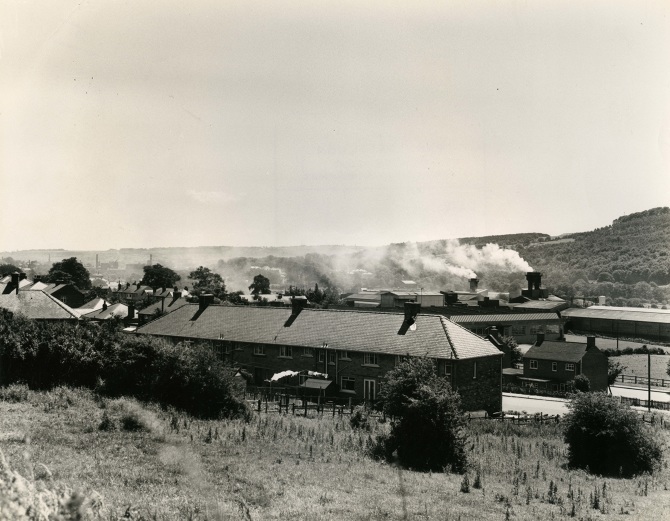 1938 - taken over by the St Helens Cable and Rubber Company. 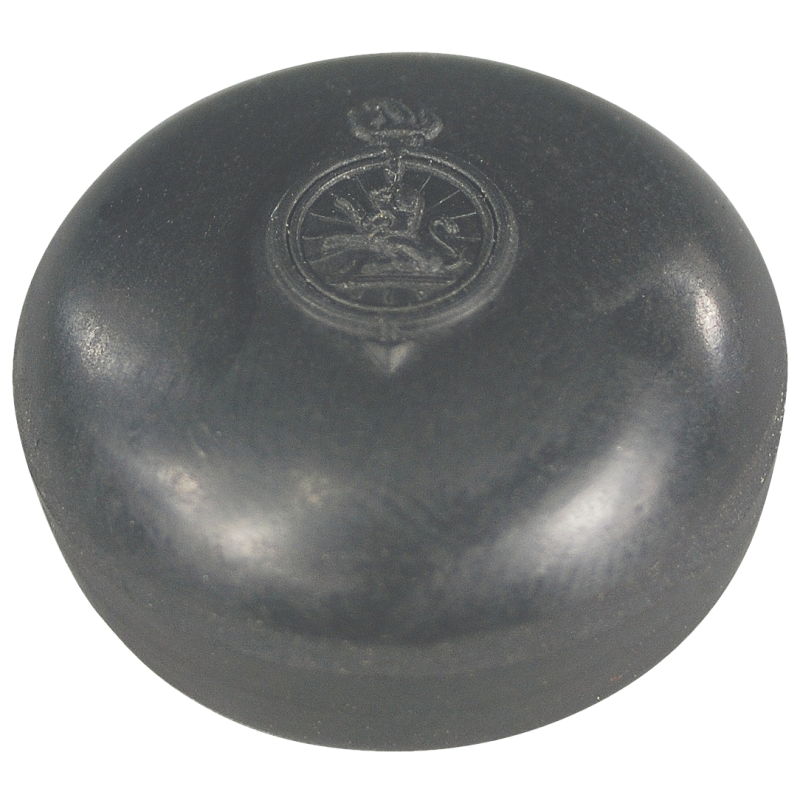 "Onazote" is an expanded ebonite and "Rubazote" is an expanded soft rubber. 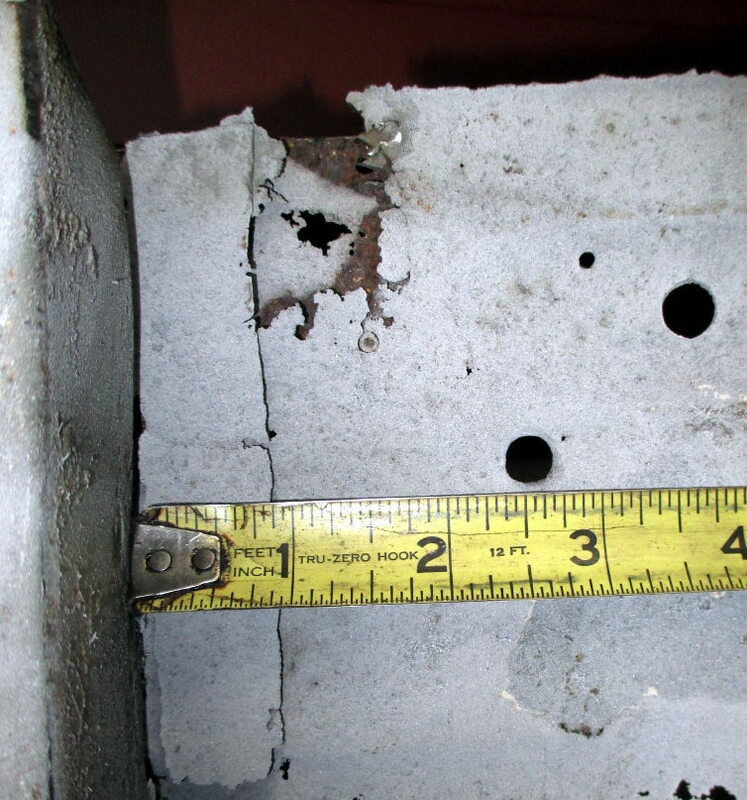 Both these materials are non-hygroscopic. "Rubazote" which weighs about 12 lb. per cubic ft. is used for pads and cushions, non-slip mats, sealing gaskets, etc. 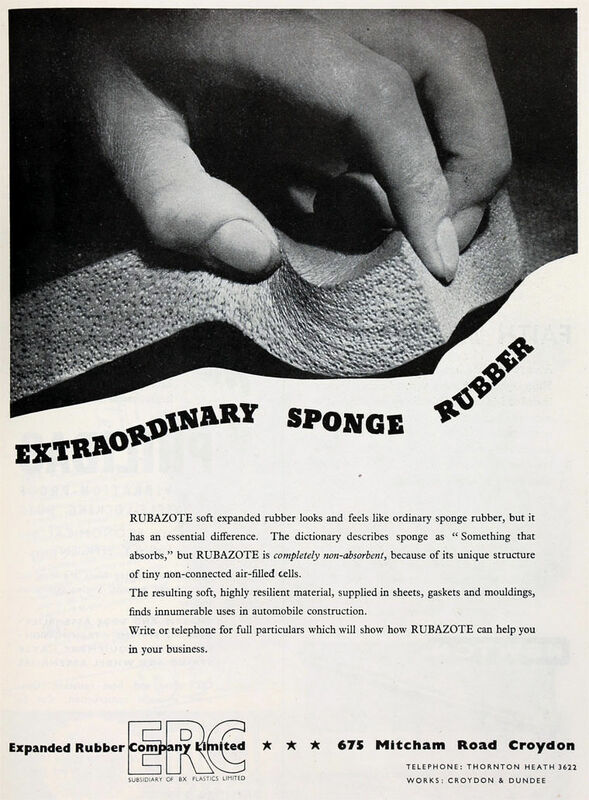 Non-absorption and lightness are its chief advantages over sponge rubber. 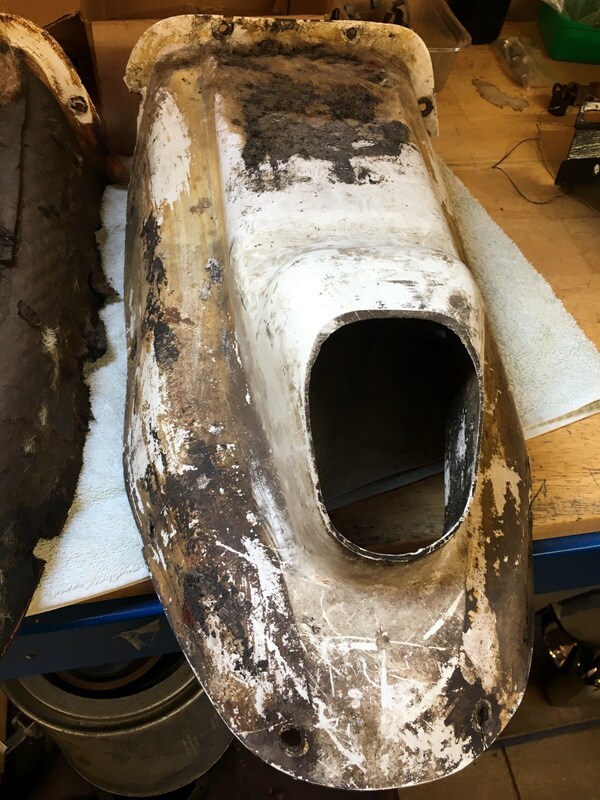 Another example of how Jaguar carefully selected the parts they used to be appropriate to the application - these cars were not just thrown together! 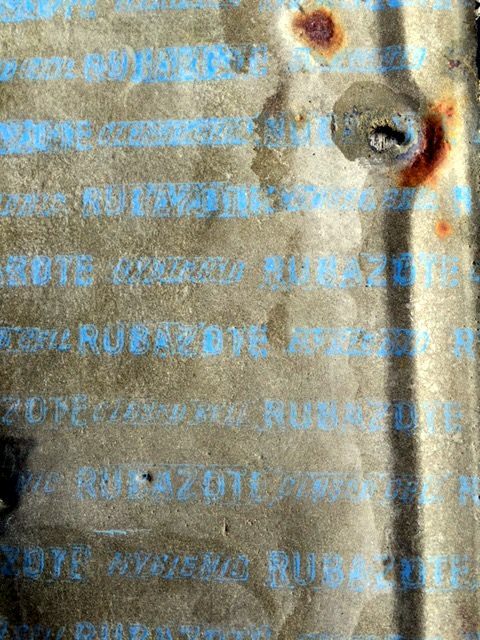 Any EPDM rubber sheet can be used as a replacement although Survitec Group http://survitecgroup.com/support-training/spare-parts/ have 1/4" Rubazote sheet on their aviation spares list part #01999087 for about £40. They do not state a size and I do not know if they will sell direct to the public. http://survitecgroup.com/media/210263/s ... y-2017.pdf if you want to try. Thanks to Owen Day for the gasket photos. 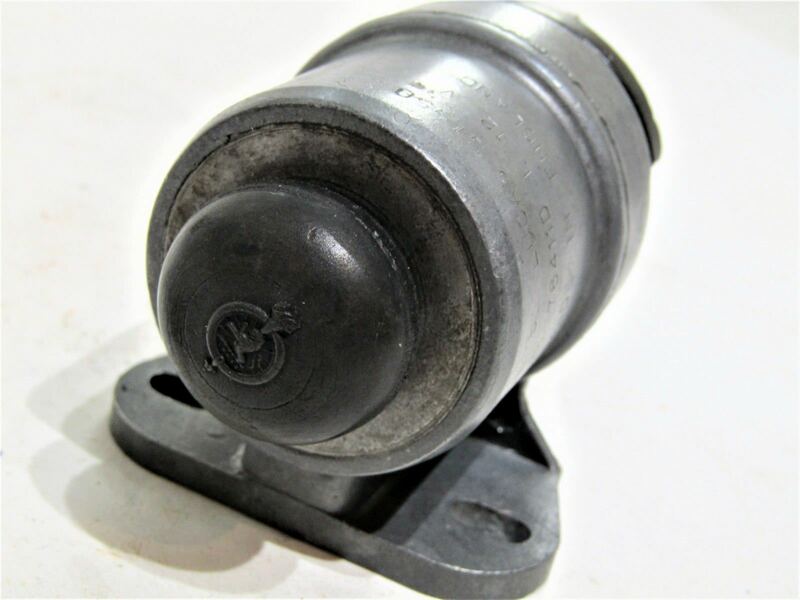 The rubber seal between the bumpers and bodywork parts BD18947/1 and BD18947/2 were originally very narrow unlike the reproduction seals available today. 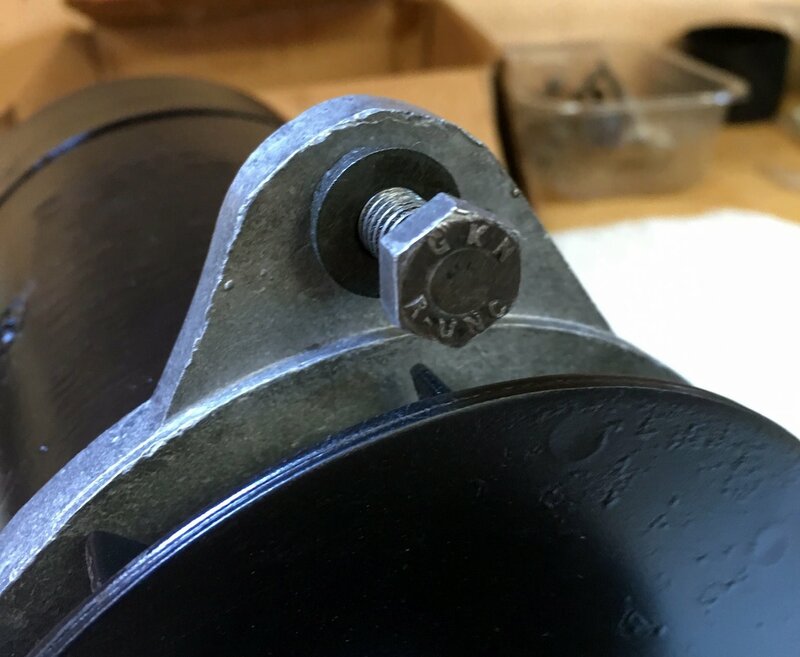 The seals increased in thickness twice culminating with the S3 seals. 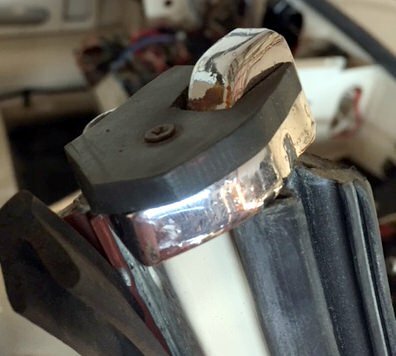 We assume this was because production tolerances increased and the wider seals allowed the bumper fitting to be easier and quicker with a greater margin for error. Once you see the narrow seal on a car you realise how big and ugly the later seals are! 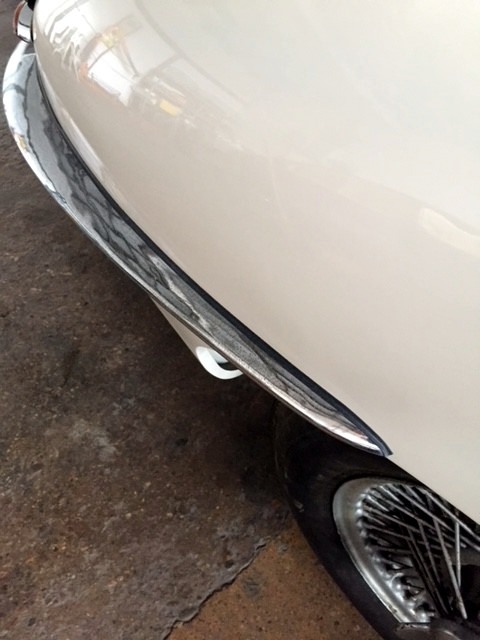 A Forum member has now had the correct narrow bumper seals made to original specification by COH Baines. 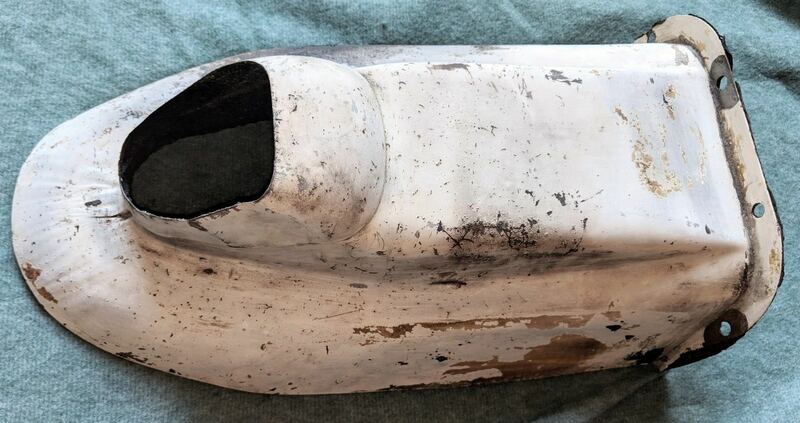 Contact the exclusive distributor e-Conic if you want a set: angus.moss@e-conic.net They can be used on any S1 car although were originally used up until early 1963. Thanks to Owen Day for the early seal photos. 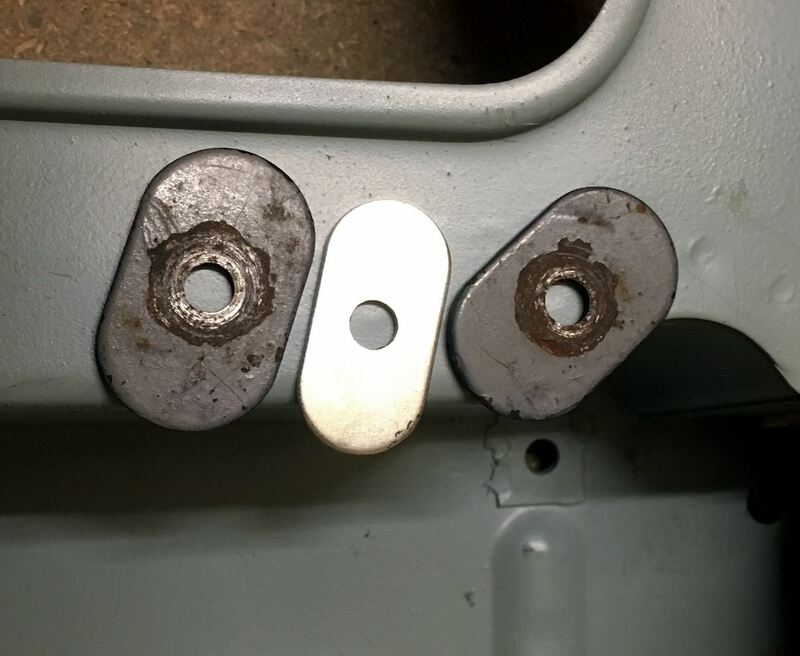 Oval washers #BD542/1 were specified for use under the nuts securing the seats to the slides and are much larger than those used on the later cars where part BD542/3 is specified. 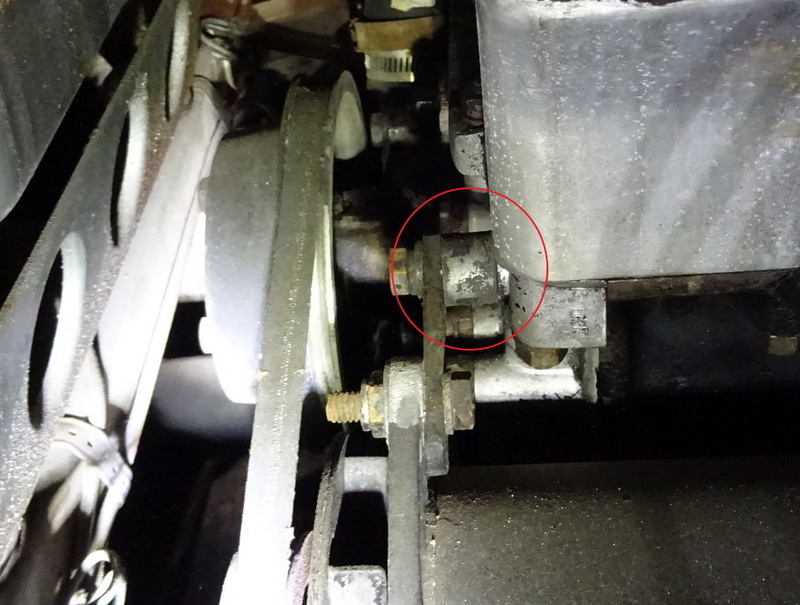 The smaller BD542/3 special washers were used on the bonnets of all cars and for retaining the seats of later cars. We do not know when this change took place but I would guess it occurred when the seats with revised rake were introduced to match the scalloped rear bulkhead in May 1962. 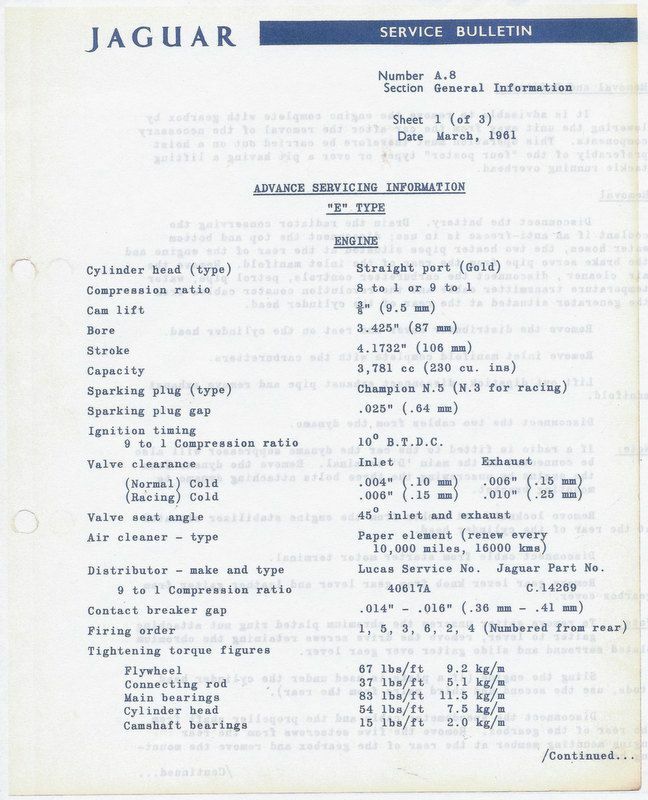 The J30 August 1961 SPC lists the BD542/1 washers whereas the June 1963 edition specifies the BD542/3 washers for the seats so the change occurred between those dates. My thanks to Ian Howe for researching this and providing a drawing for those who would like to make their own. 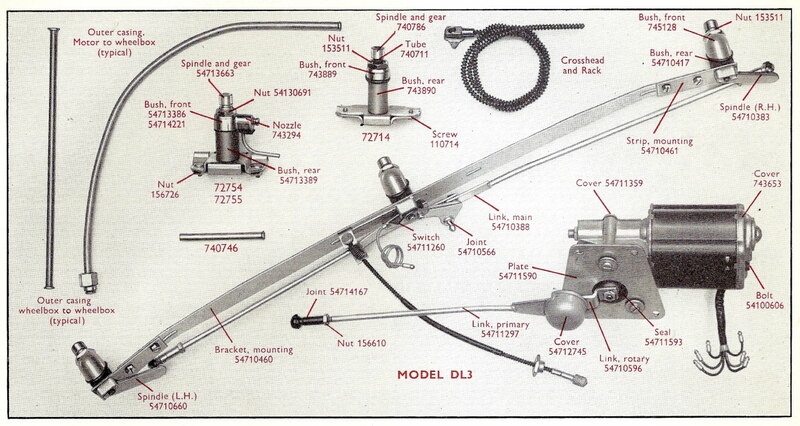 Note: the parts illustrated above the rack are for other Jaguar models and not the E-Type. Thanks to Ian Howe for the side by side photo. 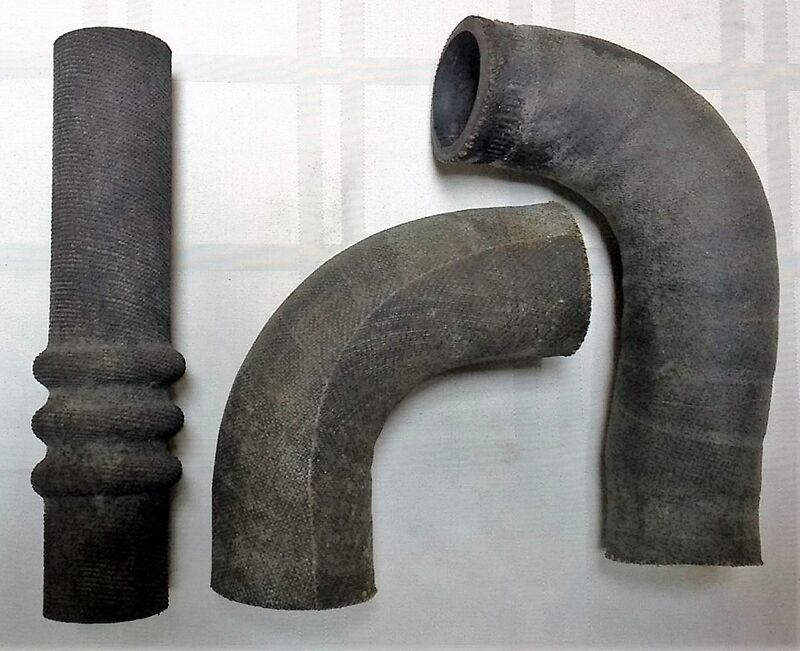 In addition at least two other hoses C12630 (lower hose) and C7548 (bypass hose) would have had the same finish. 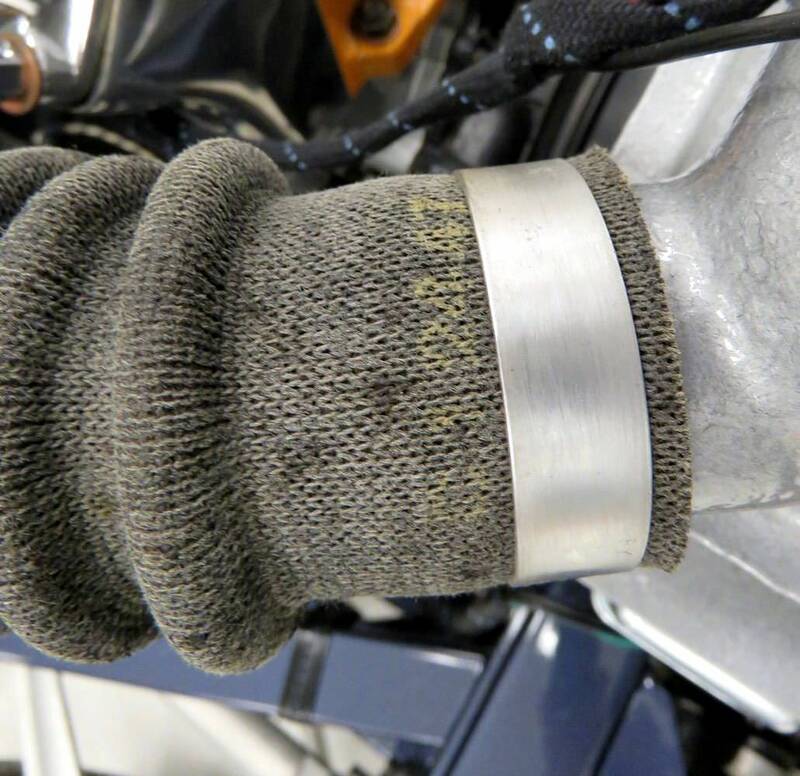 The top hose is the most noticeable so if you want your car correct it is worth getting the unique stockinette version which looks so period. 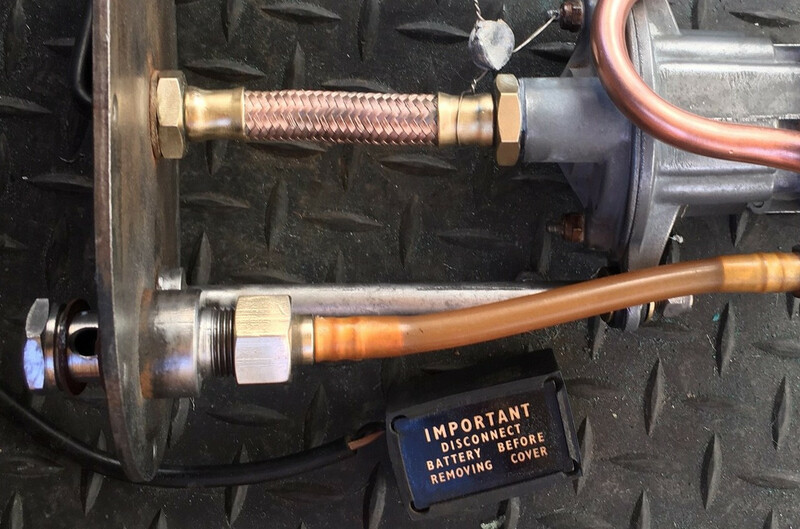 If anyone has more information on these hoses please let me know. 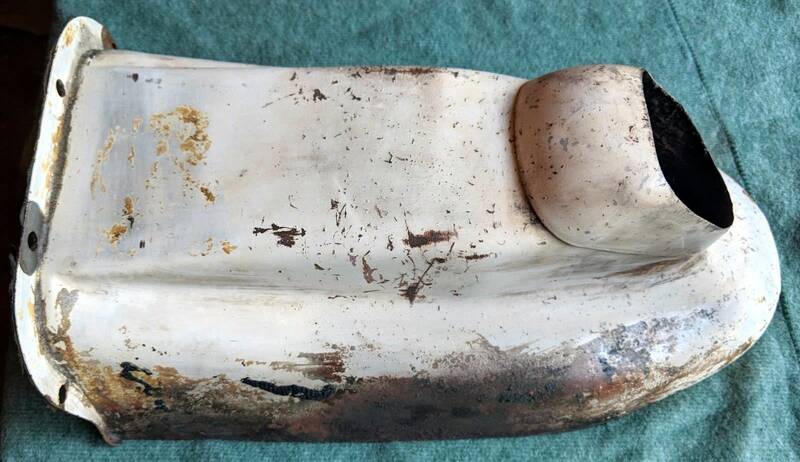 Thanks to Bud Marston, Dave Schinbeckler, Ian Howe and Owen Day for help in documenting this item. 1901 - A.W. 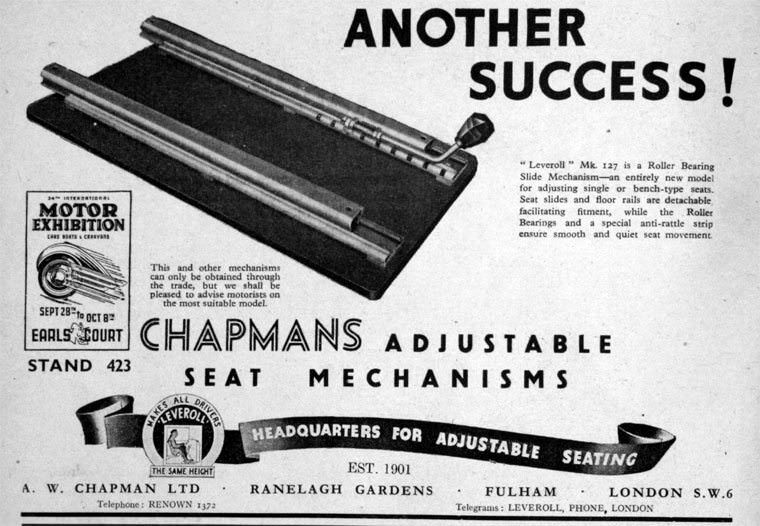 Chapman Ltd founded by Mr Albert William Chapman in the Midlands developing a patent for seating before relocating to Scotland and then to Ranelagh Gardens in Fulham, London. 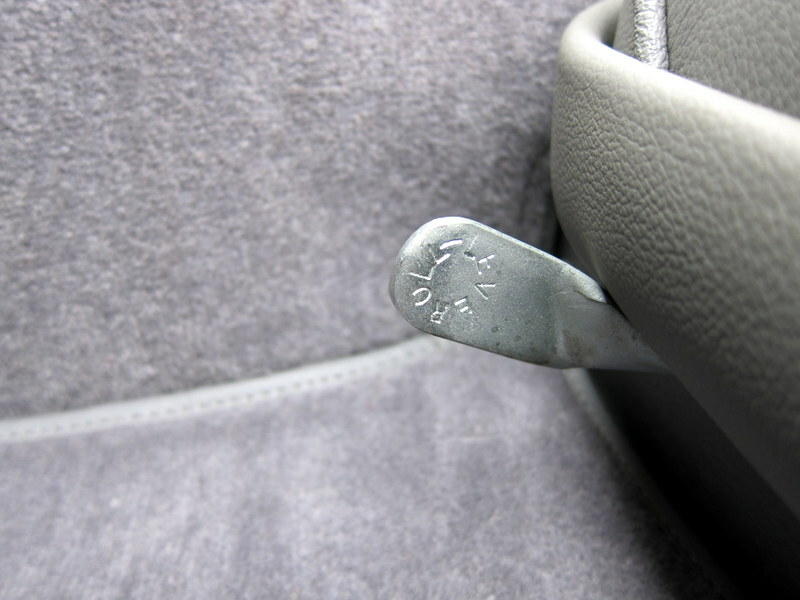 1930’s – Marketed seat products under the ‘Leveroll’ such as dual friction slides, basic seat tilt mechanisms, and duplex seat winder mechanism protected by over 30 world wide patents. 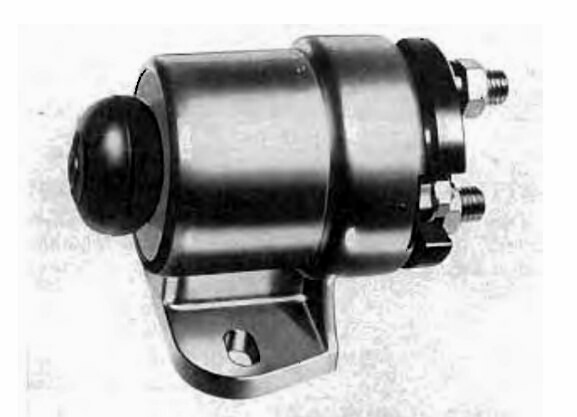 1939 – 1945 - Chapman had produced about half a million seats and fittings for the military. 1950’s - After the war the demand for adjustable seats became even greater. The Centurion, Matilda, Crusader, and Churchill tanks all carried Chapman seating as did Alvis armoured cars, including the Stalwart. 1960’s - The product range, already including fully adjustable driver's seats and mechanisms, increased to include luxurious passenger seating for coaches, and high quality seat back adjusters for Aston Martin, Bristol, Jaguar, Rolls Royce and Bentley. 1968 - Constructors group of companies, including Chapman Seating, was purchased by the Slater Walker Group. 1971 – A W Chapman Ltd sold to Rodd Engineering (1950) Limited, renamed Chapman Seating Ltd and factory moved back south to Shepperton Still in operation today. 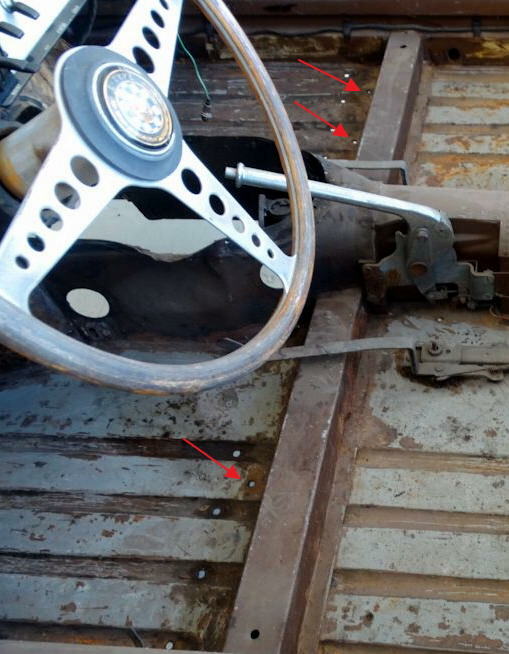 Jaguar used Leveroll adjustable seat runners in the E-Type. The very early cars had shorter runners than later cars. The modification was made to increase leg room following Press complaints. 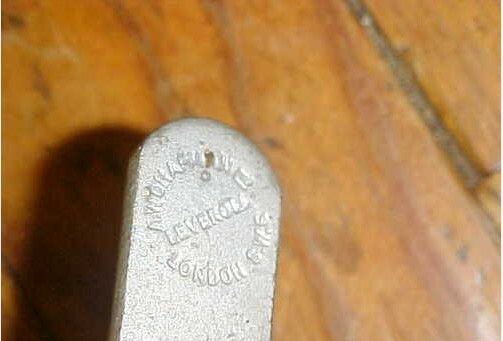 Leveroll Seat runner levers - early type. Later version had the manufacturer name in smaller text and 'London'. No rubber tips, which came with the 4.2 cars. Notice how the lever is fouling the seat base - the distance pieces C18698 are missing. 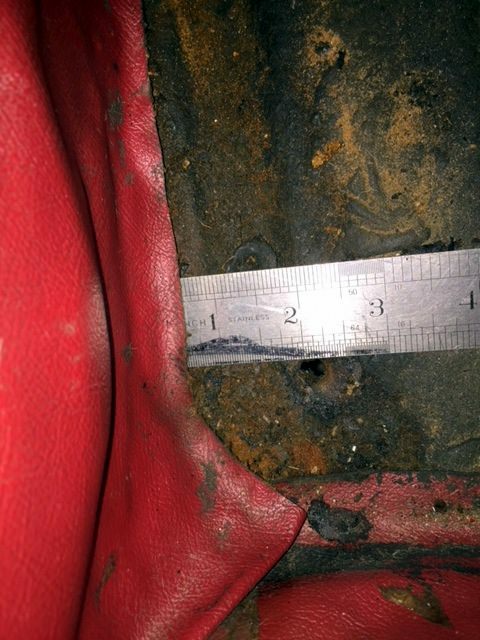 The front floor carpets were retained in place by metal clips which pushed into white nylon sockets attached to the floor. 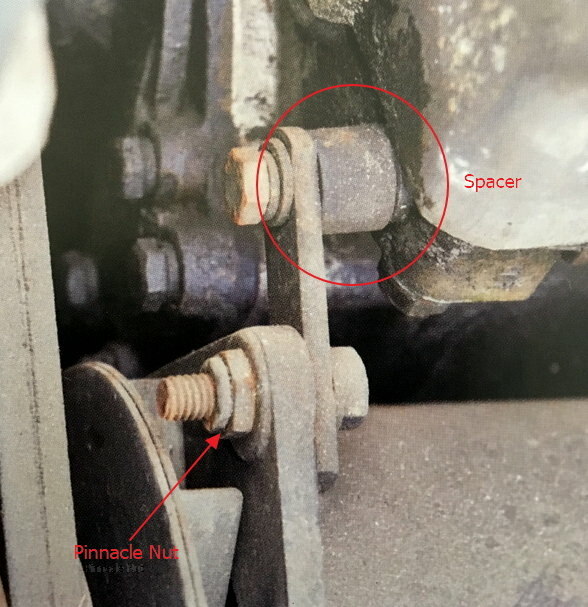 The sockets and clips have been found on car 860058, a very original FHC featured in Clausager’s Factory Original book. 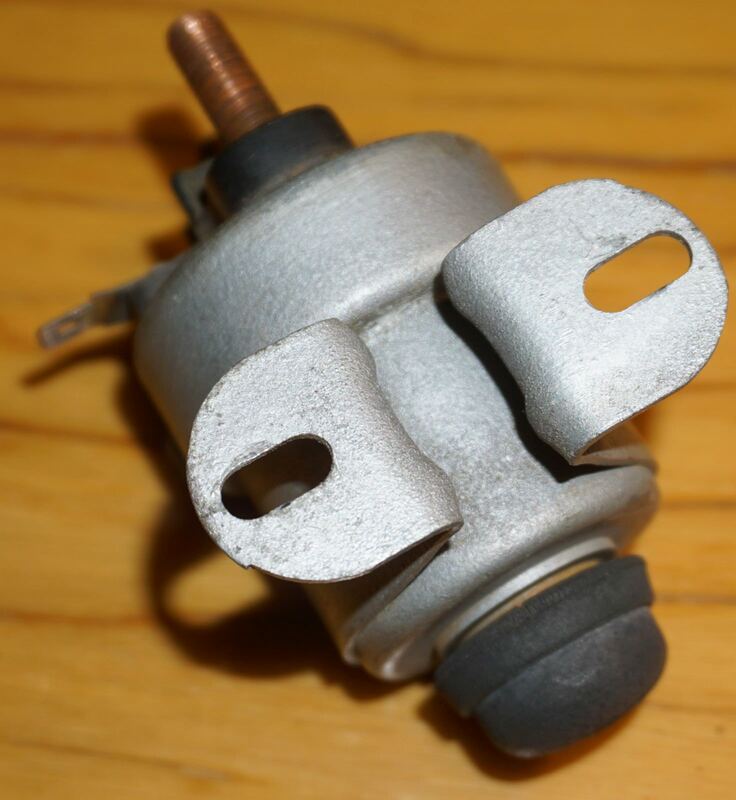 They have been found in many other early cars as well although at least one very original FHC was seen not have them. 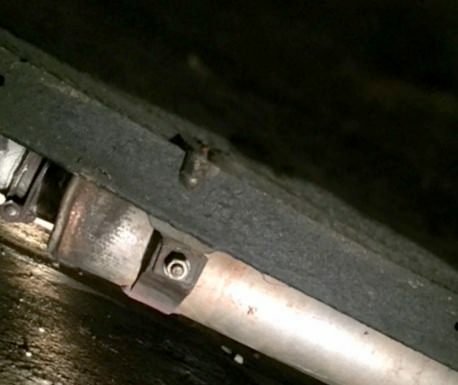 Neither of the J30 SPC’s reference the clips or sockets either by mistake, omission or they were included in the carpet “assemblies” as Jaguar referred to them. 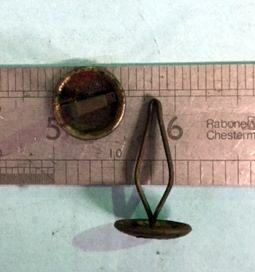 Two clips were used at the rear of the mat and none at the front. 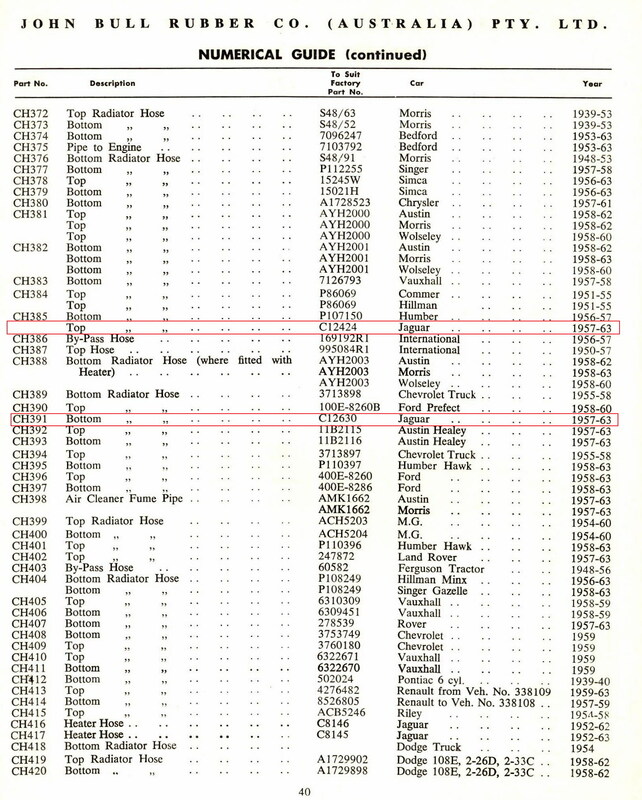 The Spare Parts Bulletin issued in November 1963 says cars 850772/861325/880412/889347 onwards “incorporate Carpet Fasteners identical with those used on Mark 10 cars” - eight in total and gives them part numbers BD22666 and BD22665 - replacing the two clips used previously. 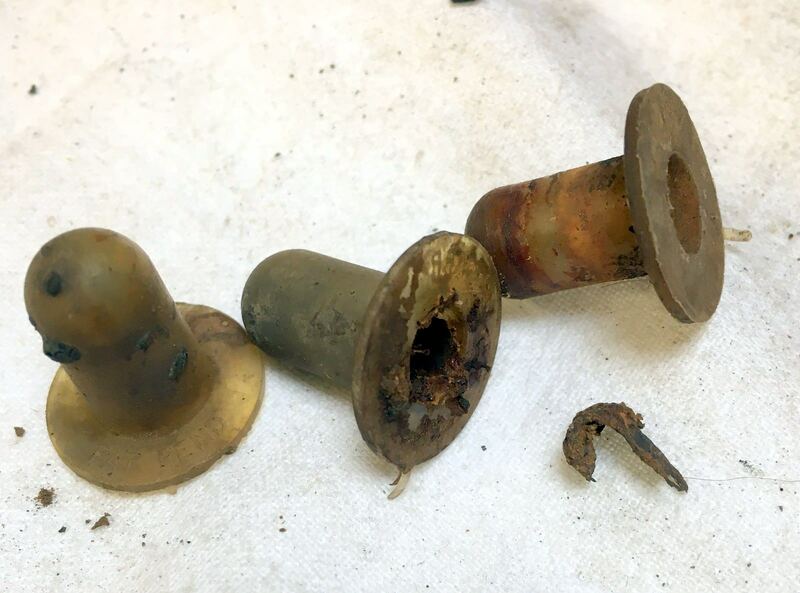 These are the plastic plugs and sockets which are commonly seen and are still available although not to the original pattern. 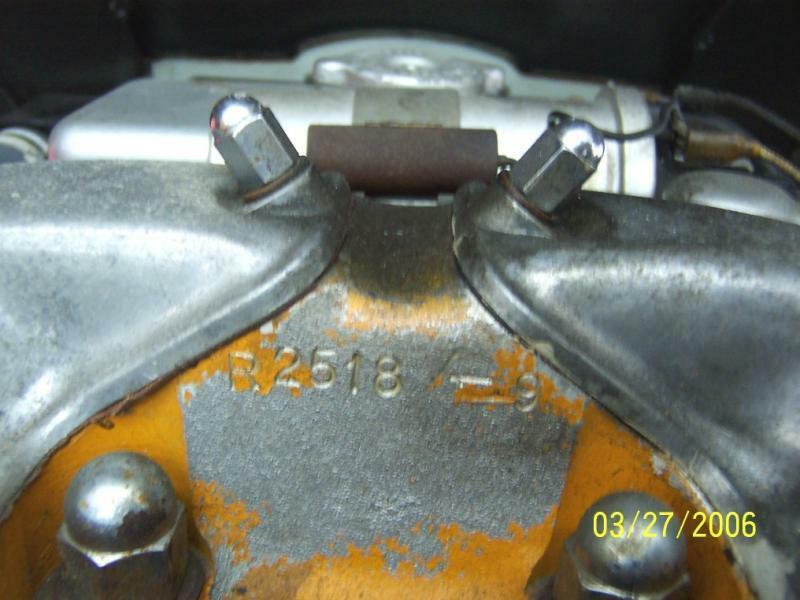 Searching on those part numbers shows them to be no longer available and superseding to a non Jaguar part number. 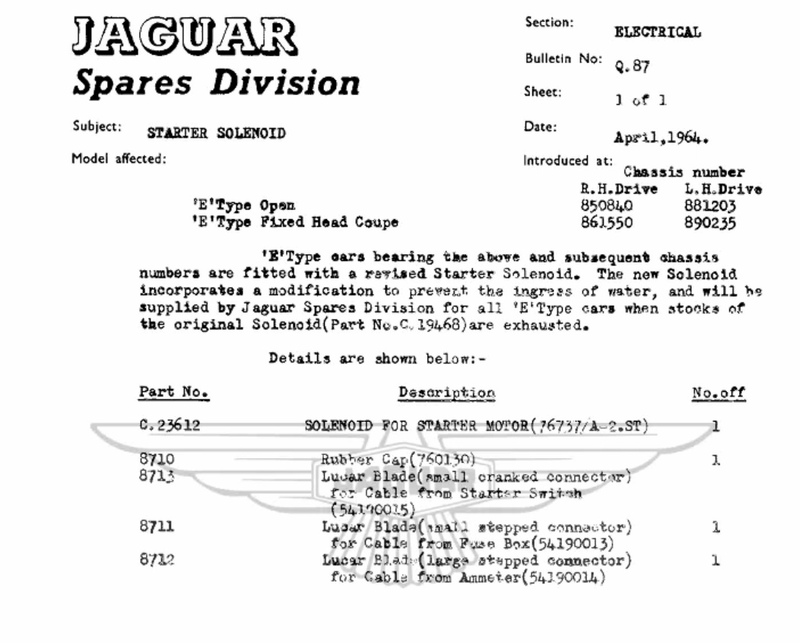 The change is noted in Clausagers Book 'Factory Original Jaguar E-Type' as "Oct 1963 - Carpet fasteners changed to plastic studs; SPB P.100". Many thanks to Ian Howe and Owen Day for photos and information. Complete sets of the correctly marked and sized nested box spanners are very difficult to find. They were made from seamless steel tubing with drilled tommy-bar holes and formed hexagon heads. 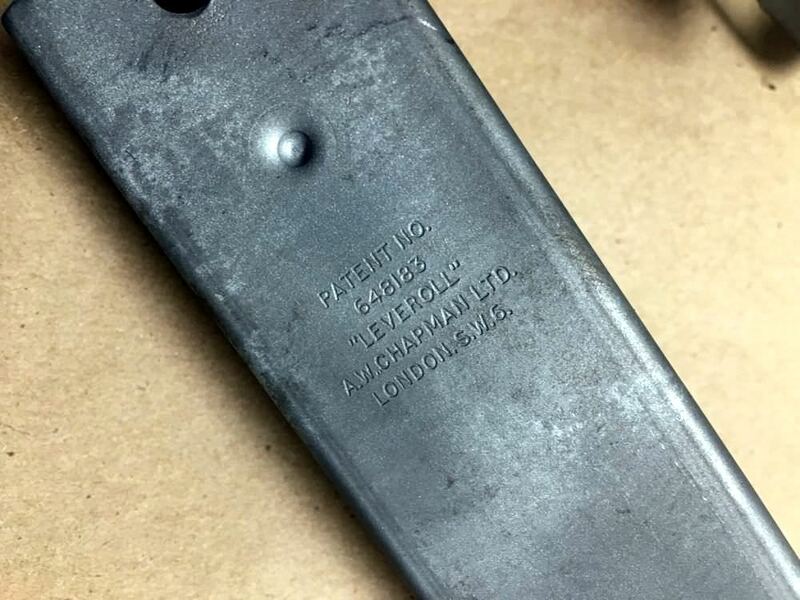 The AF sizes were roll stamped into the circumference of each spanner gun-blued (a form of controlled rusting). 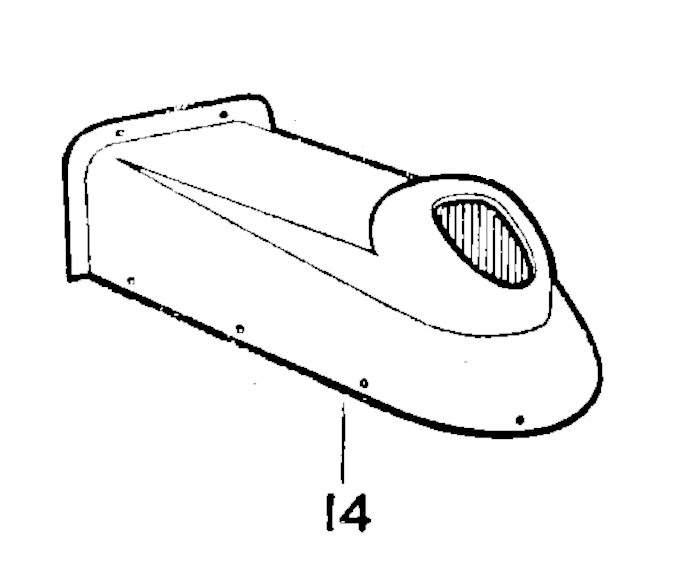 The early cars (up to December 1961) would have had a 5" long C4094 (7⁄16x1⁄2in S.A.E.) 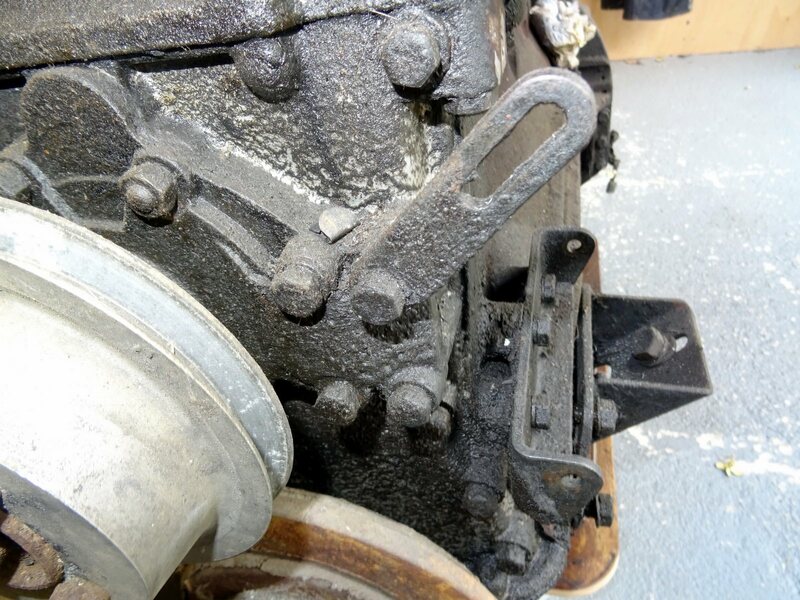 box spanner whereas later cars had a 6" long one to match the rest of the nest. Many thanks to Bud Marston for supplying the photos. 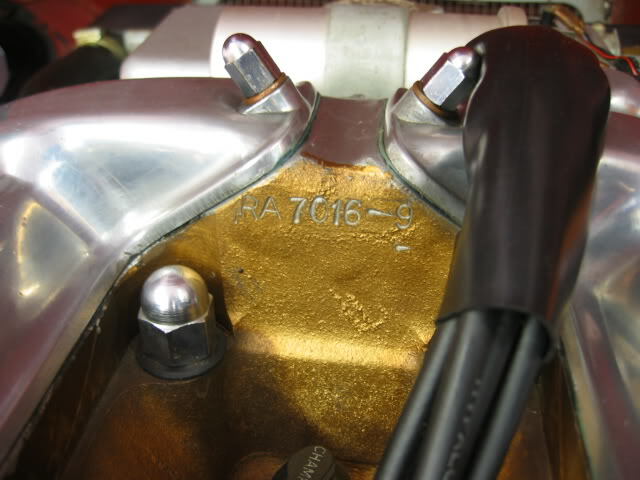 Cars produced up until October 1961 had the cylinder heads painted the same colour as the XK150S engines - Bradite 'Golden Yellow', a standard British Standard colour. After this date the heads continued to be painted Gold but rather than a solid paint it was a metallic finish - known by Bradite as 'Old Gold'. To Jaguar it was still "Gold"! Canley, Coventry, Warwickshire (now West Midlands). Telephone: Coventry 5306. Telegraphic Address: "Bradite, Coventry"
1936 - Bradite Ltd company established by James Waddicor to manufacture specialist paints under the Bradite brand. 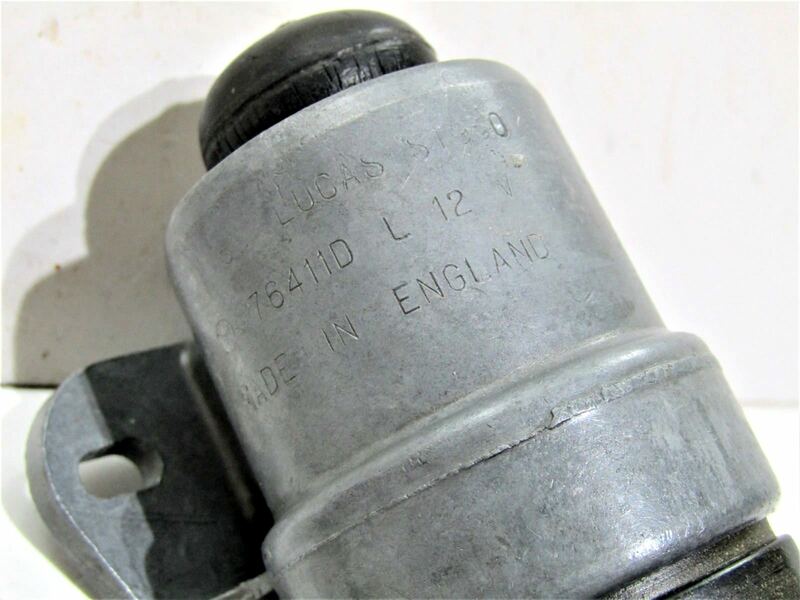 To understand what colour was used by Jaguar we need to first understand how industrial paint was marketed and sold in the UK in the mid 20th centuary, in particular the British Standard for paint colours BS381. Published in 1930, BS381 was the BSI's first colour standard. In fact BS381 was not a co-ordinated range of colours at all but rather a collection of individually specified colours; used for camouflage, identification, signalling and coding systems; by the armed forces and other government departments, public bodies and industry. In 1948, shortly after the Second World War, BS381 was revised as 'BS381C: Colours for ready mixed paints'. A further revision in 1964, published as Colours for ready mixed paints, was described as "for identification or other technical purposes, or for purposes based on long-established practice". In subsequent years various colours were added in response to the requirements of London Transport and the Ministry of Defence. At one point the standard consisted of 107 colours; however this has now been reduced to 91, in the latest version of BS381C. Although each colour within the standard has its own number; each also had its own name, used more often in the past than now. These names, often predating the standard and relating to "long-established practice", will strike a chord of nostalgia to anyone who loved Airfix models as a child. Such evocative names include: Oxford Blue, Brunswick Green (often known as British Racing Green), Light Buff, Golden Yellow, Camouflage Desert Sand, Signal Red, International Orange, RAF Blue/Grey and Dark Admiralty Grey. Note: there is no 'Pumpkin' in the BS chart. 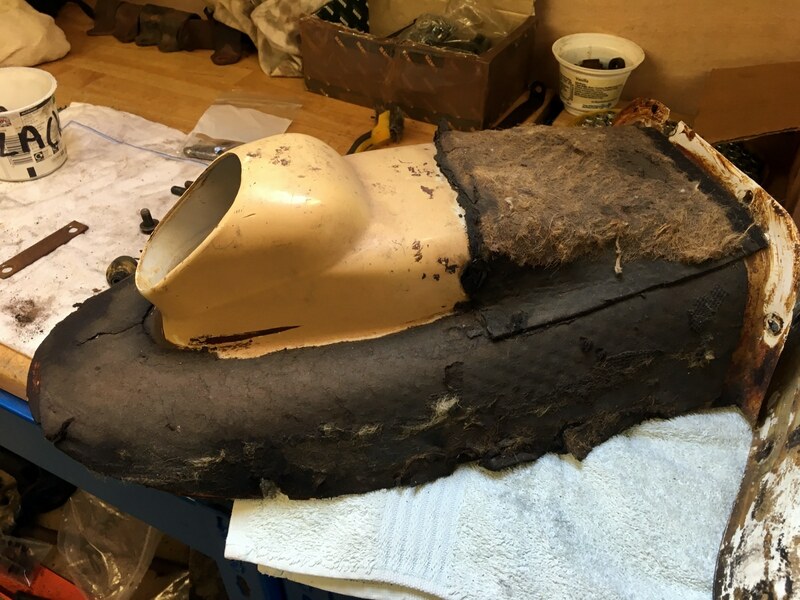 The original cylinder head paint was produced by Bradite and Jaguar records show it was 'Gold' although as it was to BS381c standards it was known as 'Golden Yellow' in the paint industry. Those same records do not show a different colour paint used after 1961 - it is recorded as 'Gold' throughout XK150S and 3.8 production. Confusion was caused by Bradite supplying Gold metallic (known as Bradite Old Gold) to Jaguar from mid 1961 onwards rather than the solid Golden Yellow used previously. We do not know whether this was a request from Jaguar after supplies of Golden Yellow were exhausted, a clerical error in the order process or production problems at Bradite which forced the change. The early cars non metallic paint has retrospectively been called 'Pumpkin' by the Americans who know what that vegetable is but a puzzlement to us Brits (we don't have Pumpkins - Turnips, yes). "Gold' is a shade of Orange that is 71% saturated and 81% bright. For reference purposes, Gold has the hex value #CFB53B." BS381-356 'Golden Yellow' is the correct period colour for the cylinder head for the early cars. Hex value #F2A600. Bradite do produce a heat resistant paint called 'Fastrac Heat Resist' and it appears to be available in BS381c colours. '633 Squadron' is a 1964 British film that depicts the exploits of a fictional World War II British fighter-bomber squadron which was based on a novel of the same name by Frederick E. Smith, published in 1956. The RAF did not form a unit called "633 Squadron" during the Second World War however Smith drew on his military service and used the nickname aircrew gave to the painters who worked on the base - the 633 Squadron. '633' is the BS381c paint code for RAF Blue/Grey and they painted everything that colour - bowsers, Nissan huts, kerbs, gates, equipment etc. 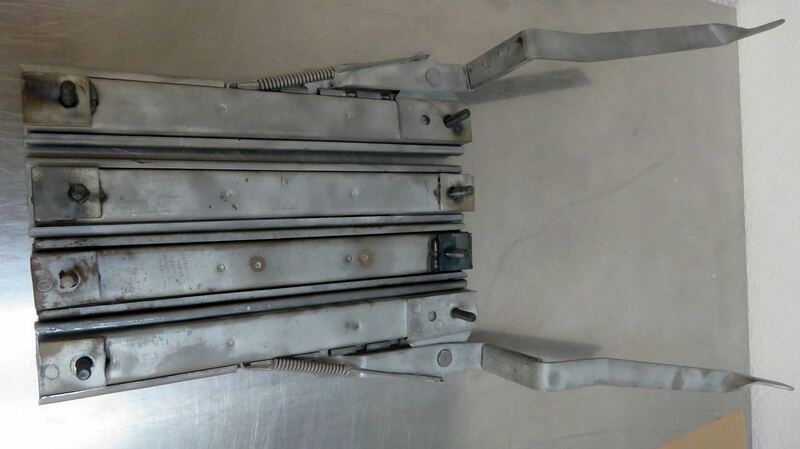 The Envelope Assembly BD20721 originally used three hold down straps with 'Lift the Dot' fasteners (sockets) together with three cinch plates to secure the sockets. 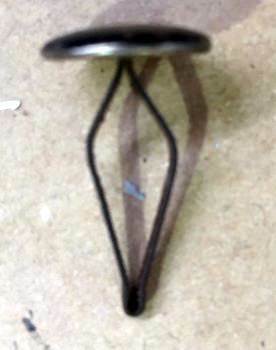 The two side straps were secured by 'Tenax' fasteners. 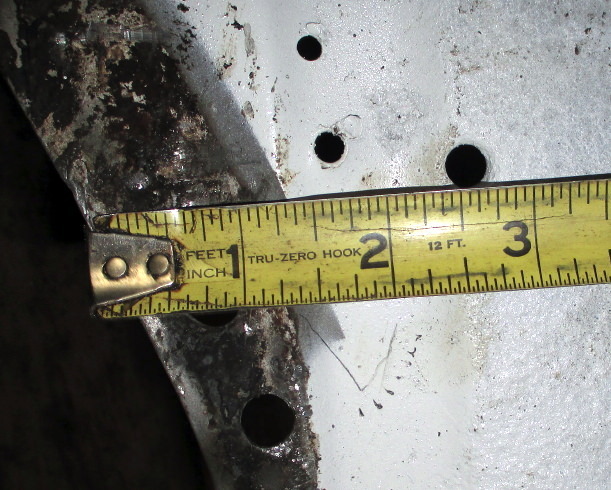 The rear of the envelope was held in place by leather covered four hooks that located under the chrome trim on the very early cars and with hooks attached to the chrome on later cars. The sides of the envelope were held in place by leather covered push on clips to the body. 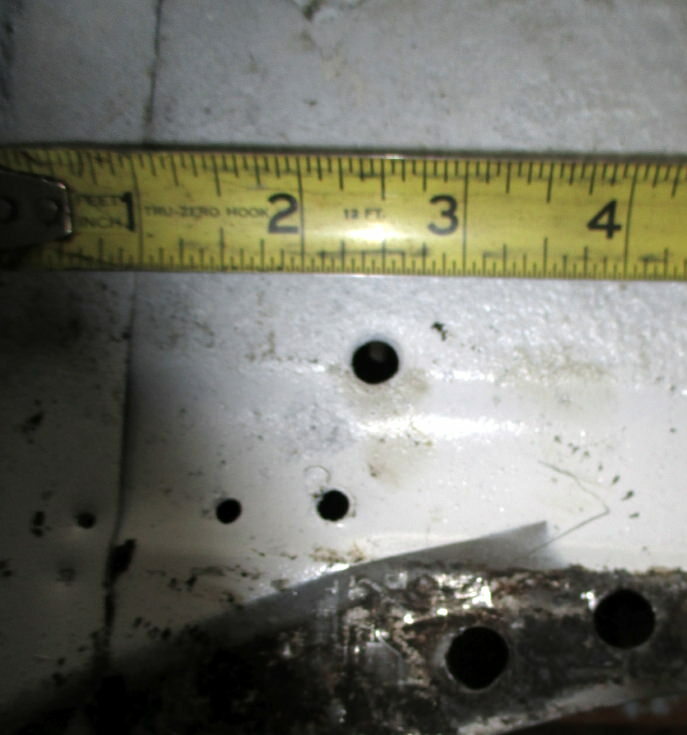 Note the car number, 5570 in the first photo and ?008 in the second, crayoned to the inside of the envelope. 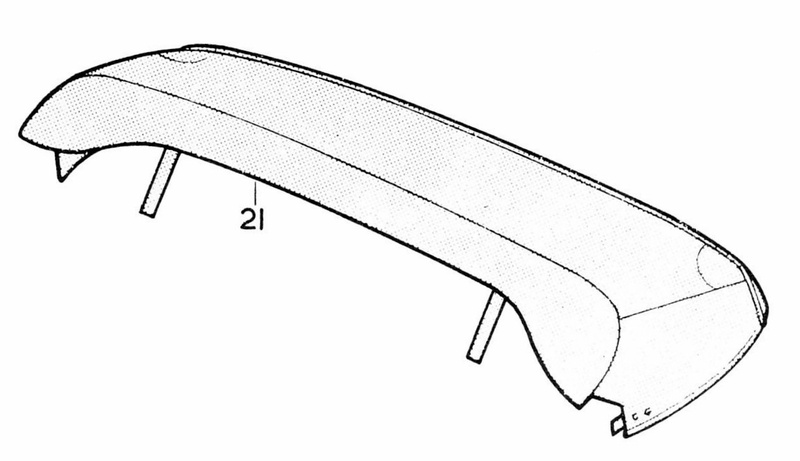 In about October 1964, from cars 850935/881865, the envelope was modified and the middle hold down strap was deleted. 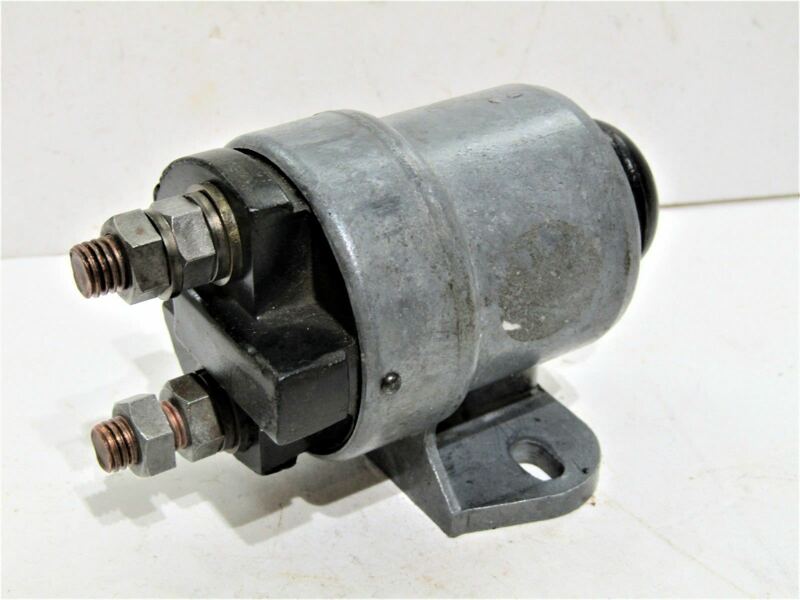 The part number was changed to BD27669 which continued for the 4.2 cars. 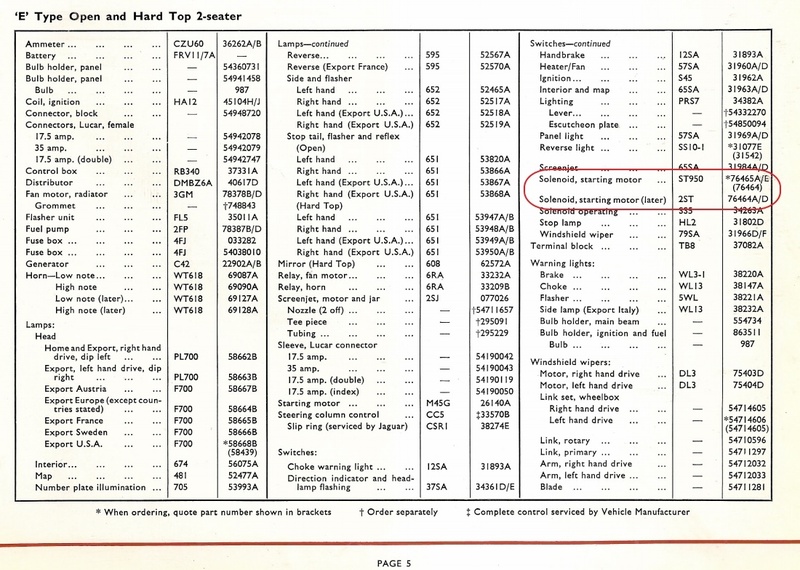 Oddly the SPC still lists three 'Lift the Dot' fasteners and cinch plates being required. The hood envelopes were made of Mohair, usually from cut-offs of the hood material, sometimes with different colour piping. 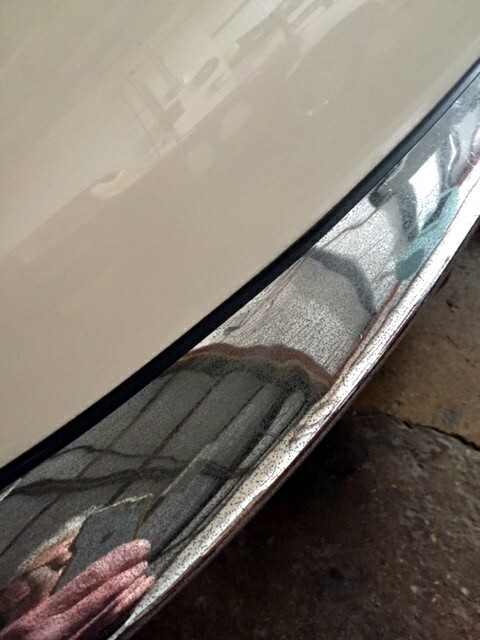 Hood and hood cover could be supplied in PVC at the customers request and at least two cars are known to have had white PVC hood and envelope. The gearbox cover BD15488 was originally moulded from white or, later, black plastic and held in place by 12 self tapping screws and washers. 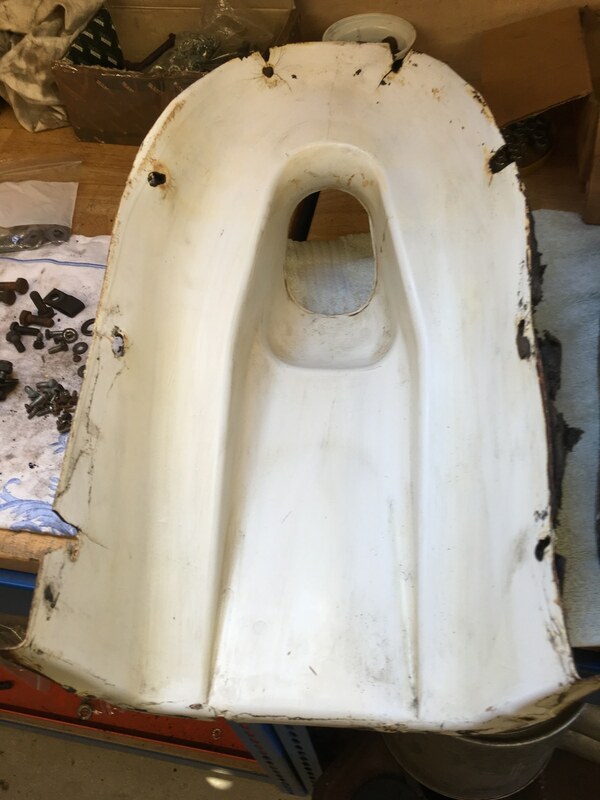 Tar paper was used to seal it to the body. 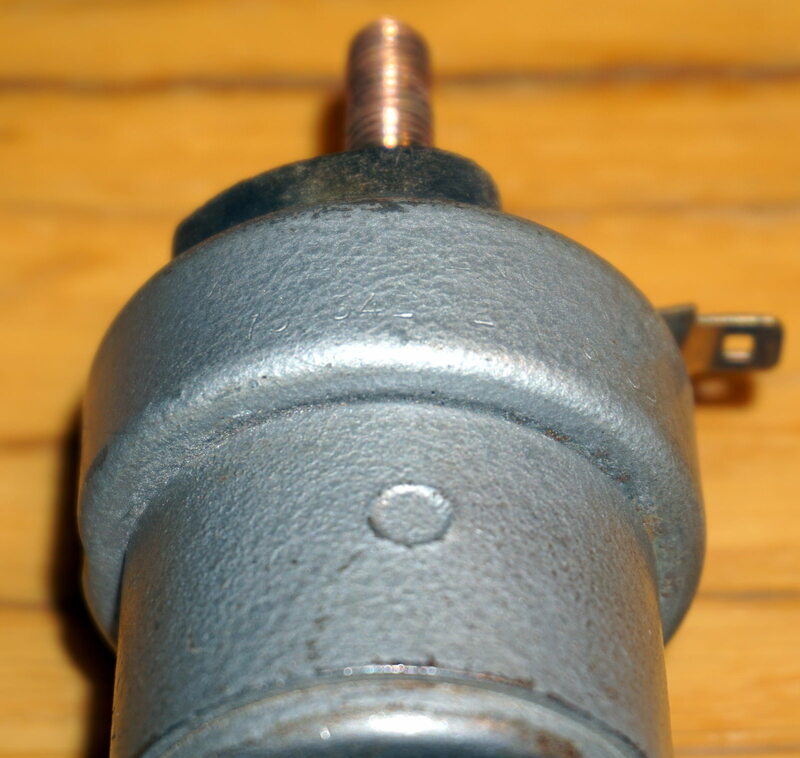 The gearbox cover was eventually remade in metal, part BD24129, to simplify installation during production. 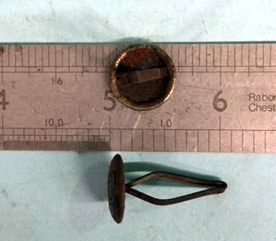 It used a metal tang at the rear to locate it and four self-tapping screws at the front to hold it in place. 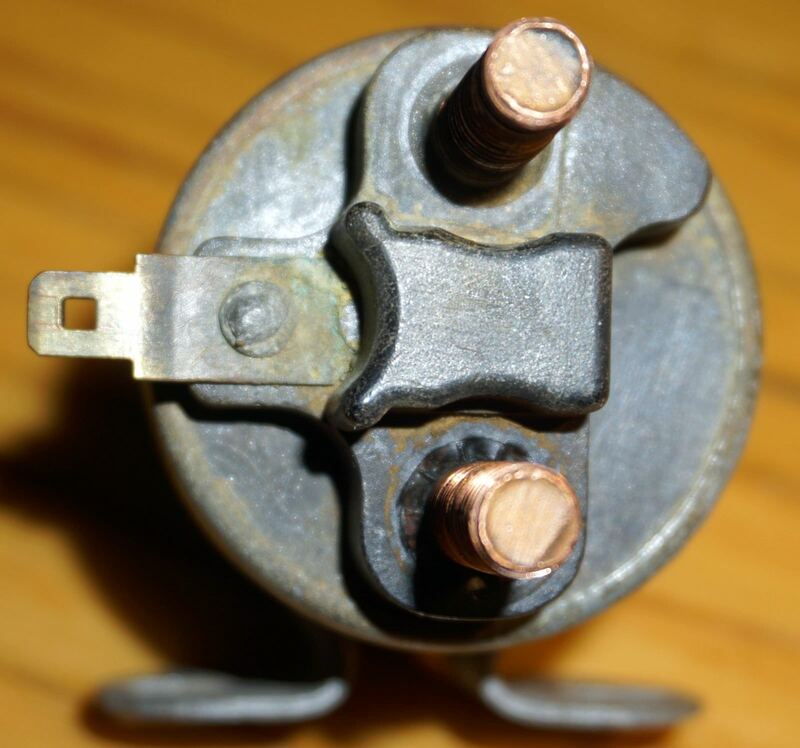 There is no known date for the changeover but the metal cover does not appear in the August 1961 J30 SPC and is listed in the June 1963 J30 (although it wrongly lists 12 screws/washers being required). The later SPC does show the plastic part superseded to the metal version so all in service replacements would have been BD24129. 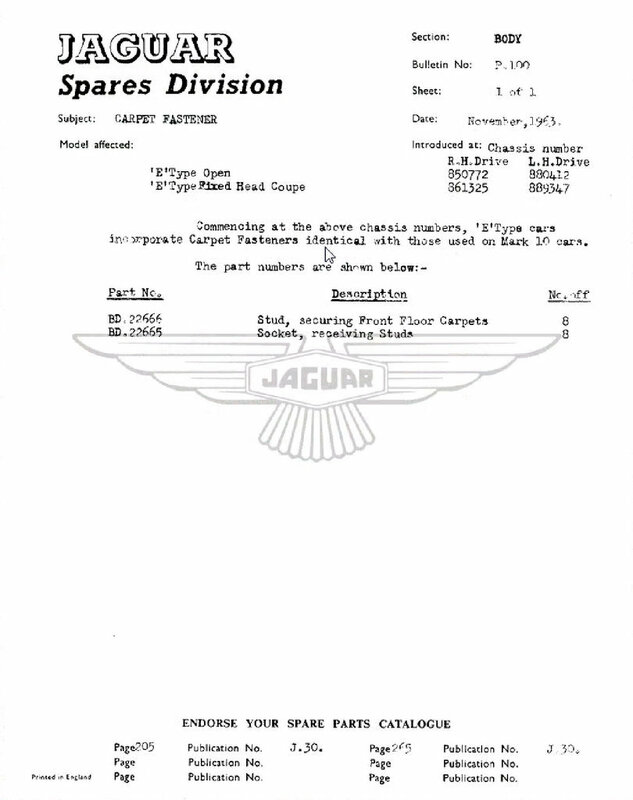 We know when Jaguar listed a new part they used the next available number in the BDXXXXX or CXXXXX sequence. 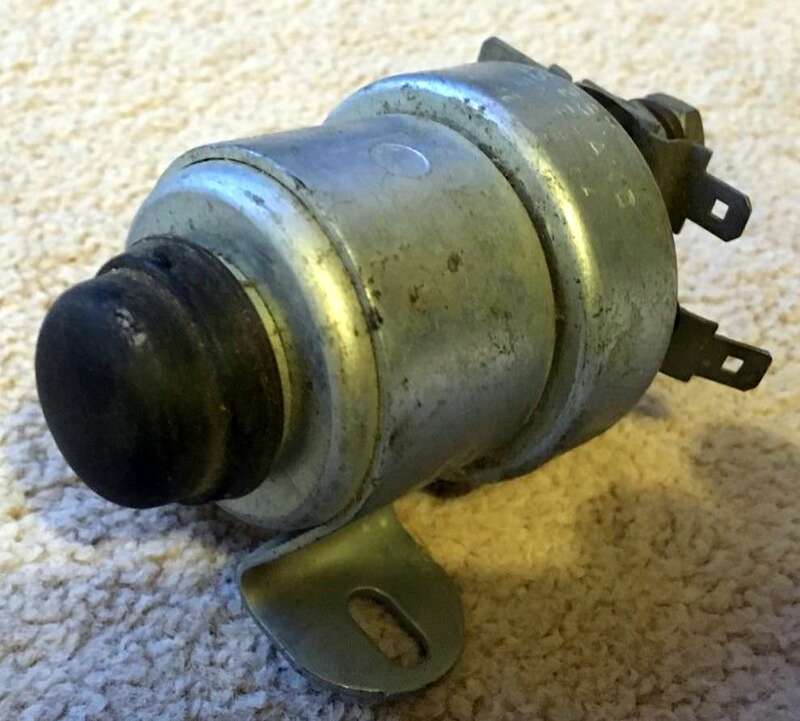 Based on other part numbers announced in the SPB's it would mean number BD24129 metal cover would have been issued around February 1963. 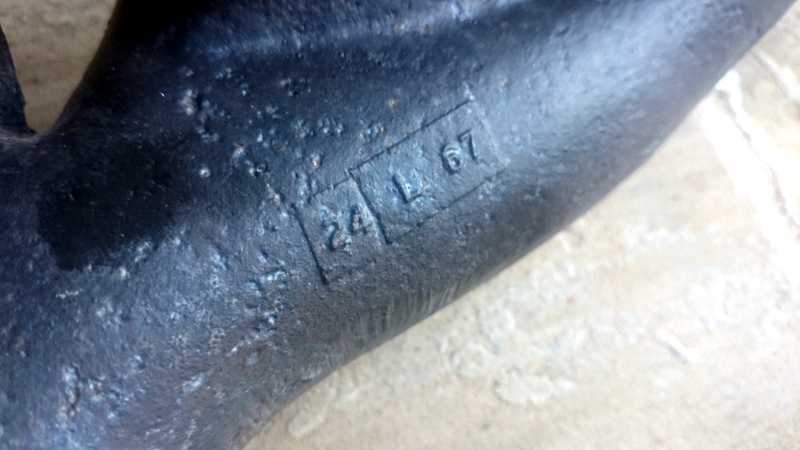 It is likely the metal cover was produced and fitted before this date however. My car is 888007 produced 28th December 62 and it has black plastic cover. Thanks Stuart. If anyone else has any data please let me know. 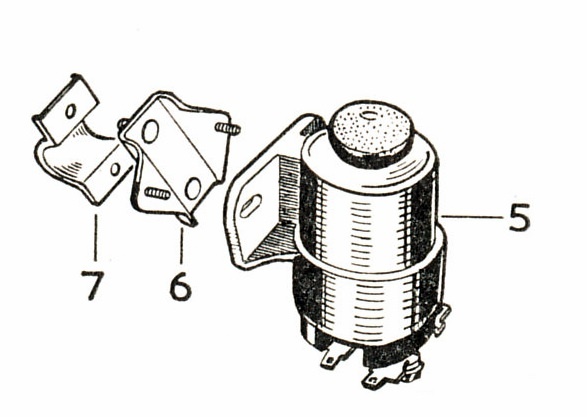 There were three versions of the dynamo adjusting link and methods of mounting. 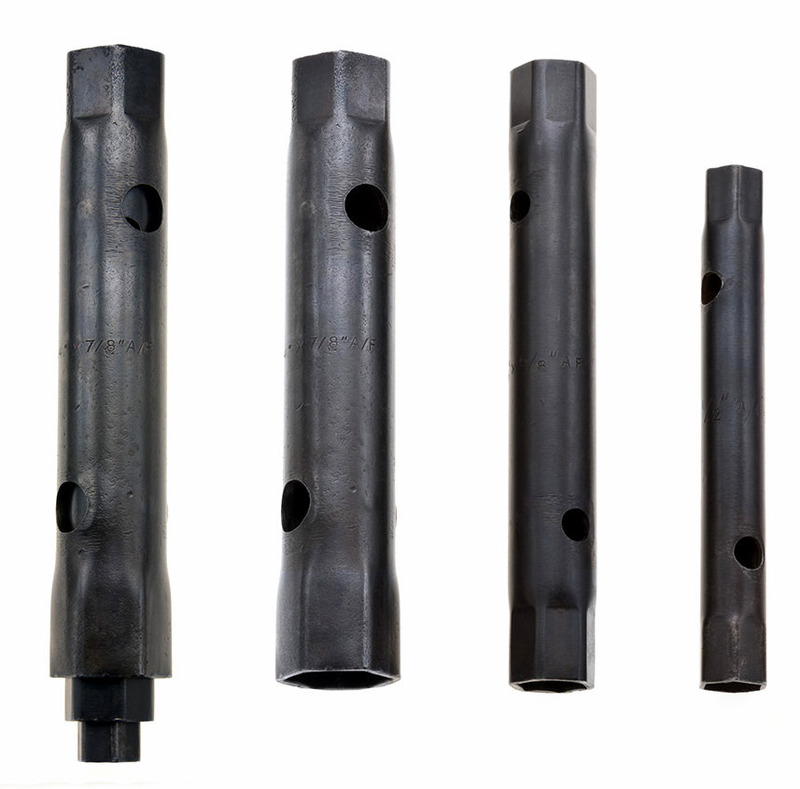 The set screw UCS13/9R is a 1 1/4" UNC with a self-locking (Pinnacle Stop Nut) C8667/10. 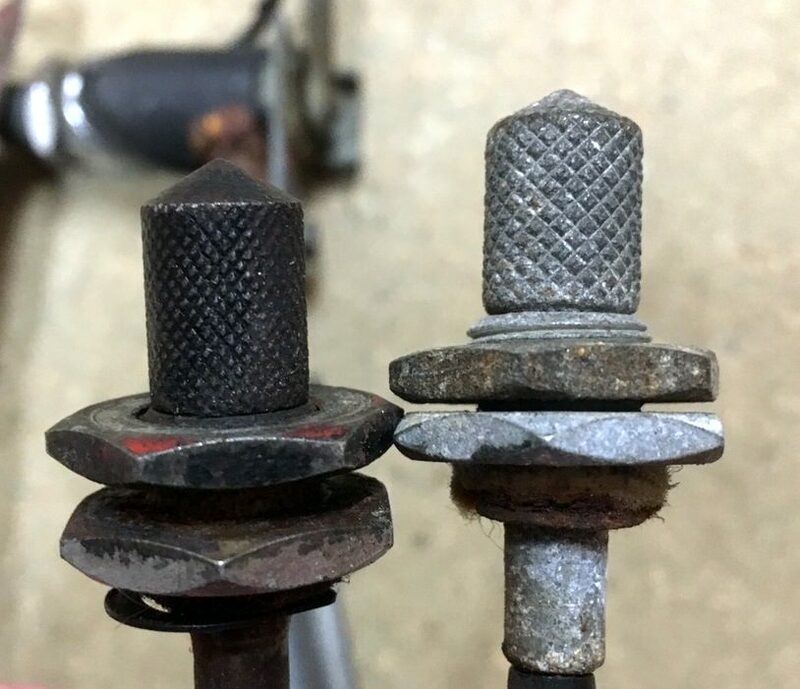 Although there are differences in the direction of the bolt in the service manual, original cars and old Factory photos the correct direction is dictated by the Pinnacle Nut. 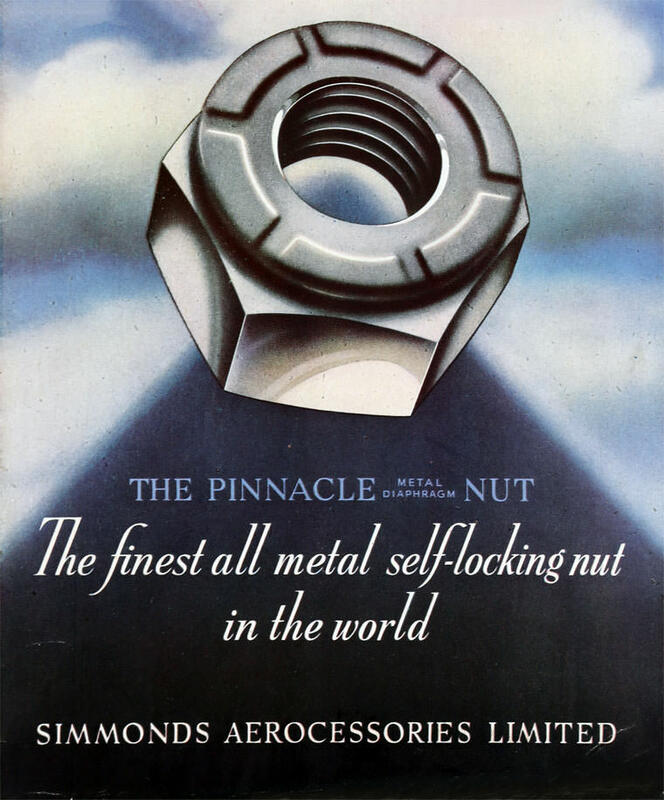 The Pinnacle Nut is a mechanical lock nut used against another threaded item, nut or flange. 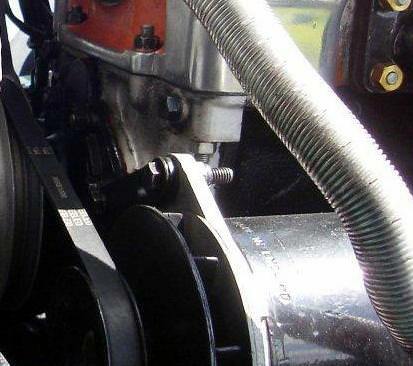 As the the flange of the Dynamo is threaded the head of setscrew should be to the rear and project forward through the link, screw into flange of the generator and tightened. 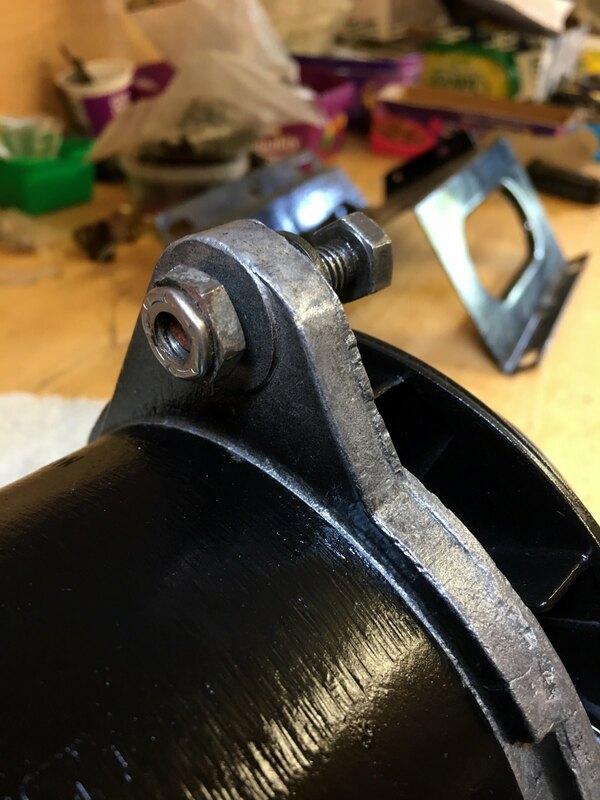 The Pinnacle Nut is screwed on to the exposed thread and locks against the flange. Copyright Haddock, Mueller page 212. (Brilliant book by the way). 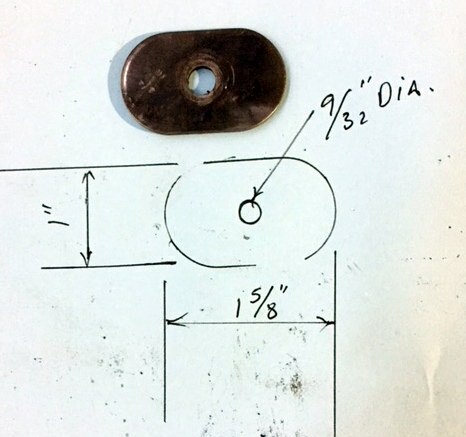 The Simmonds Pinnacle Nut uses a spring metal cap and is of all steel construction so suitable for high temperature applications but are no longer commercially available. 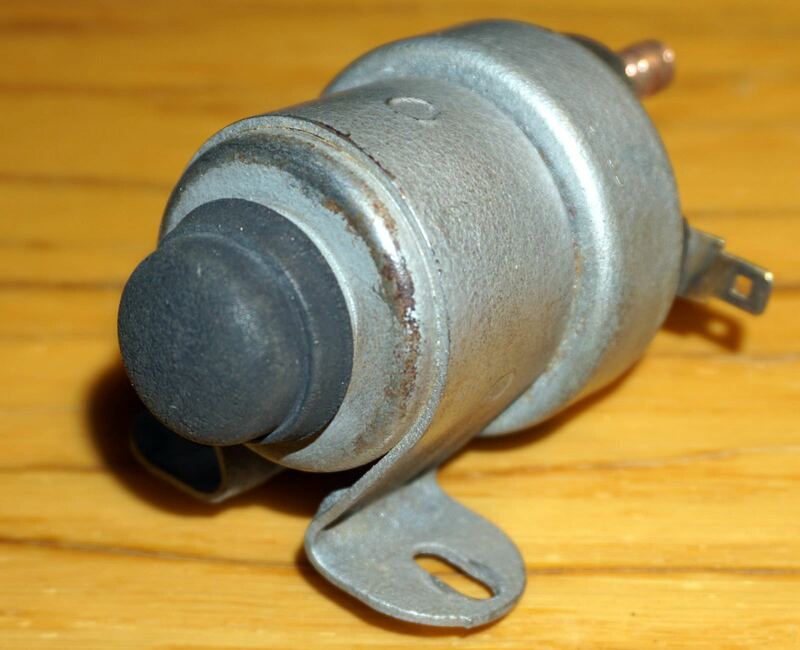 They serve the same function as a Nyloc nut but are heat resistant. Simmonds Accessories of Shell-Mex House, Strand, London, WC2. 1962 - 1st May. 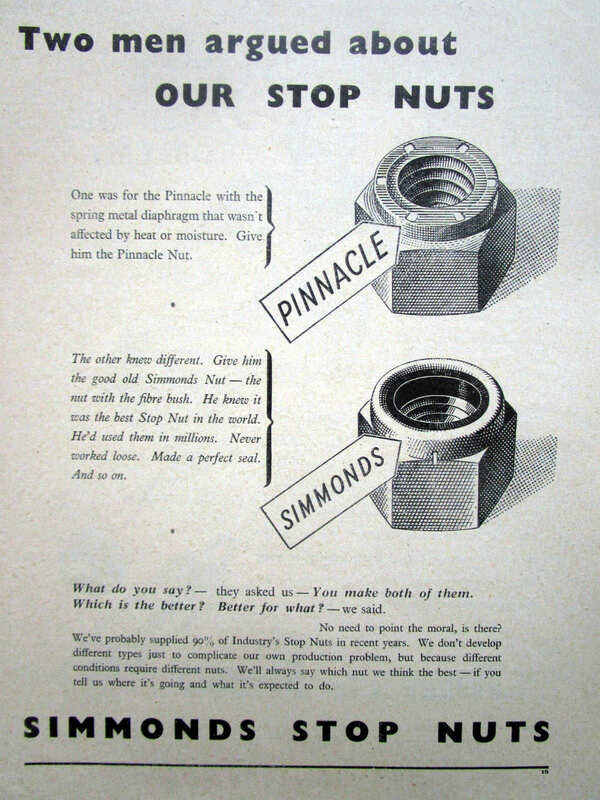 The company changed its name to Firth Cleveland Fastenings Ltd.
Factoid: Jaguar only used one Simmonds Pinnacle Nut on the entire car; all the other self locking stop nuts were the conventional Simmonds ones with fibre inserts. Many thanks to Ian Howe for supplying the photos and timeline. 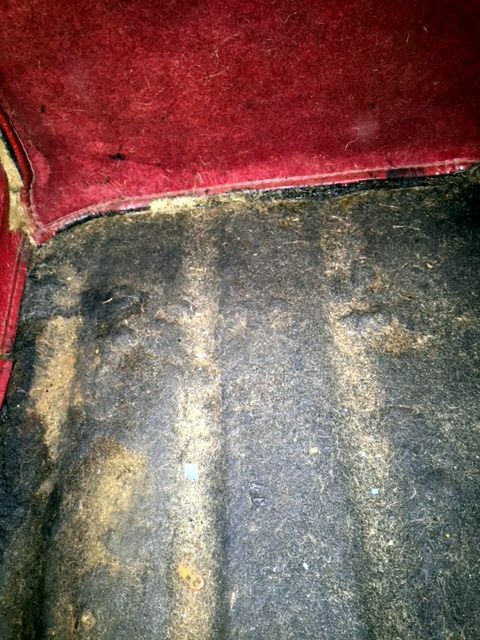 It has always been assumed that air-conditioning was not offered by Jaguar until late in production. 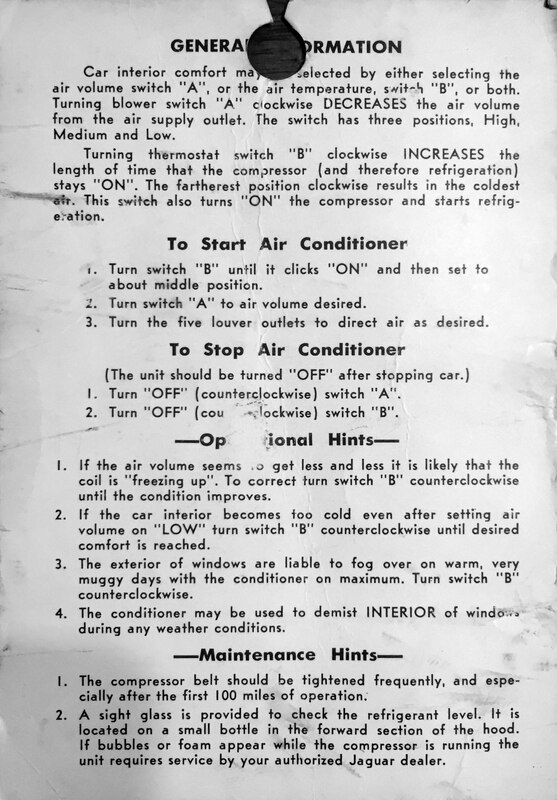 This leaflet was included in the owners wallet of car 886782 built in January 1963. 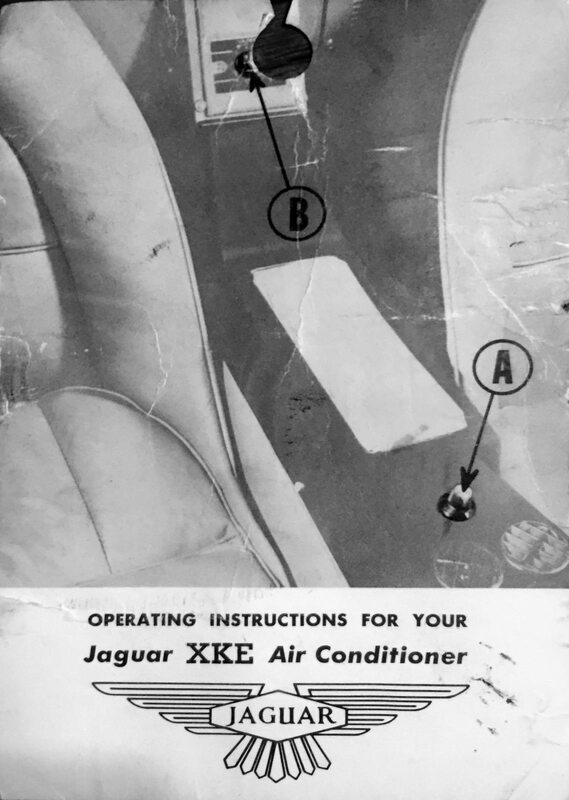 I assume the air conditioner was fitted by the Jaguar importer or dealer in the USA rather than the Factory given the text refers to 'XKE' and 'hood'. 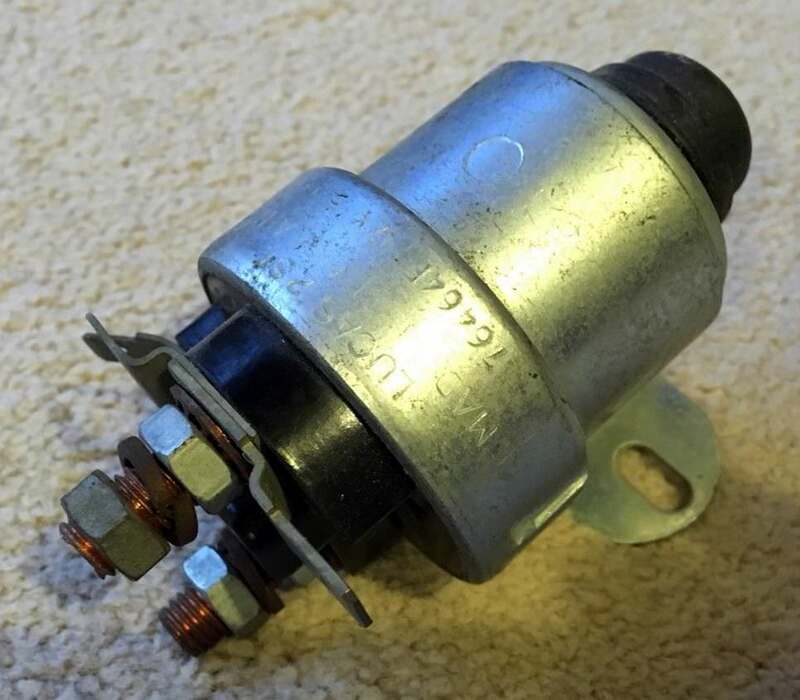 The first 500 E-Type's were fitted with the Lucas ST950 solenoid; Lucas part number 76465A/E, Jaguar part number C16047 listed in the August 1961 J30 SPC. 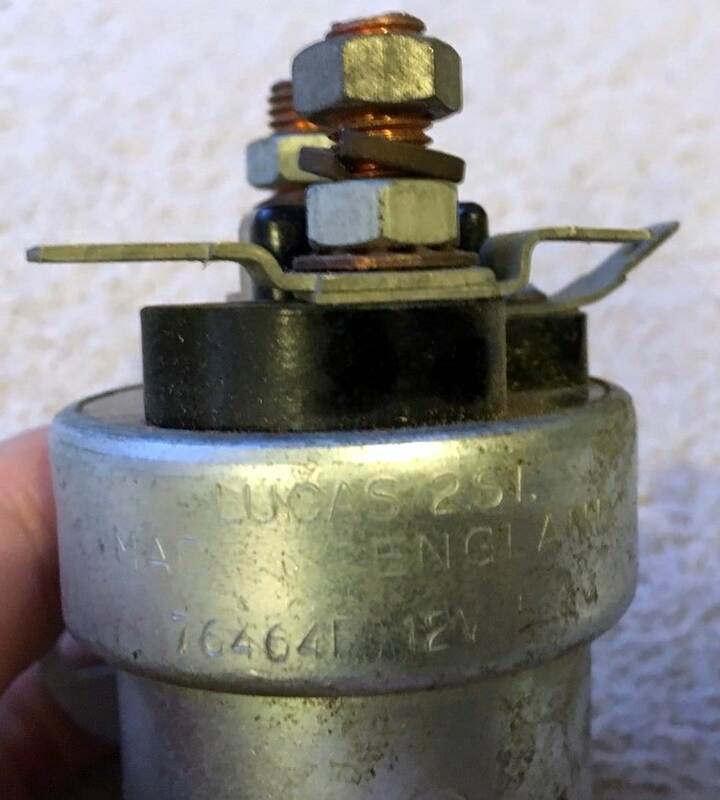 This solenoid had a cast alloy body with integrated mount, Lucar blade connectors and a black rubber cap embossed with the Lucas 'Lion rampant' logo. 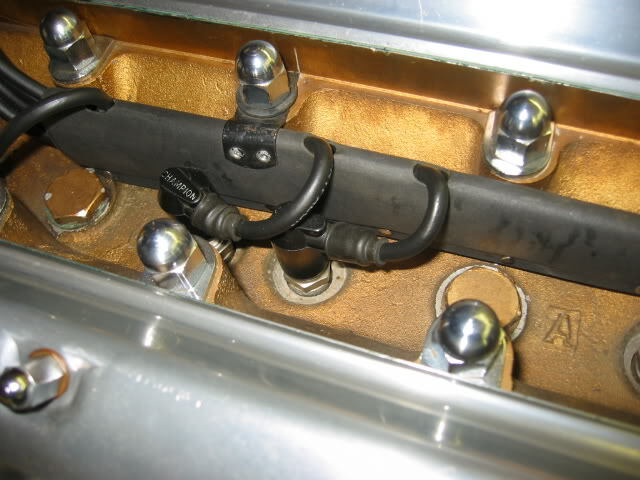 The ST950 solenoid had been used on earlier Jaguars, including the XK models, although those vehicles used loop connectors to fit the threaded terminals. 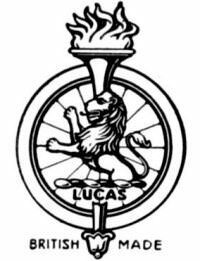 In that application it was designated with the Lucas part number 76411. 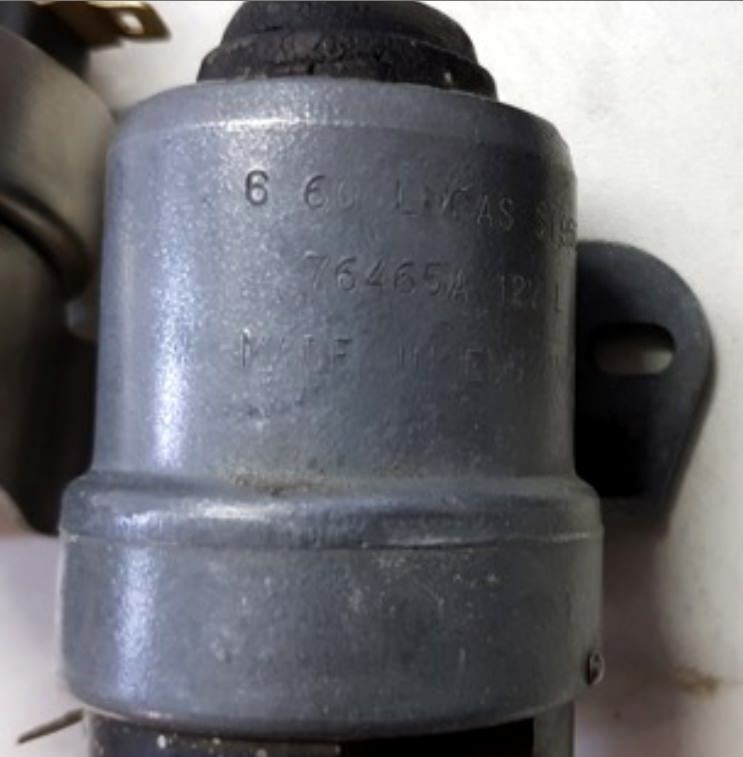 Solenoids marked 76411 may have been fitted to some E-Type's as in-service replacements by adding the three Lucar blade connectors from the old unit or as Lucas spare parts. The 76465 and 76411 are otherwise identical. 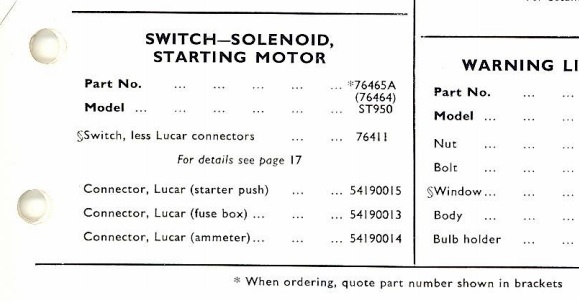 After the first 500 cars the ST950 solenoid was replaced with the 2ST model version; Lucas part number 76464, Jaguar part number C1948 listed in the June 1963 J30 SPC. This had a steel body with a steel mounting bracket spot welded on. 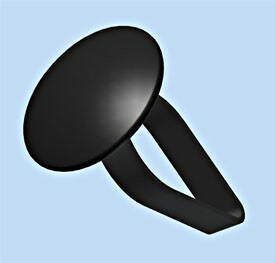 The rubber cap was also of a different shape/size so not compatible with the earlier version and has no Lucas logo. 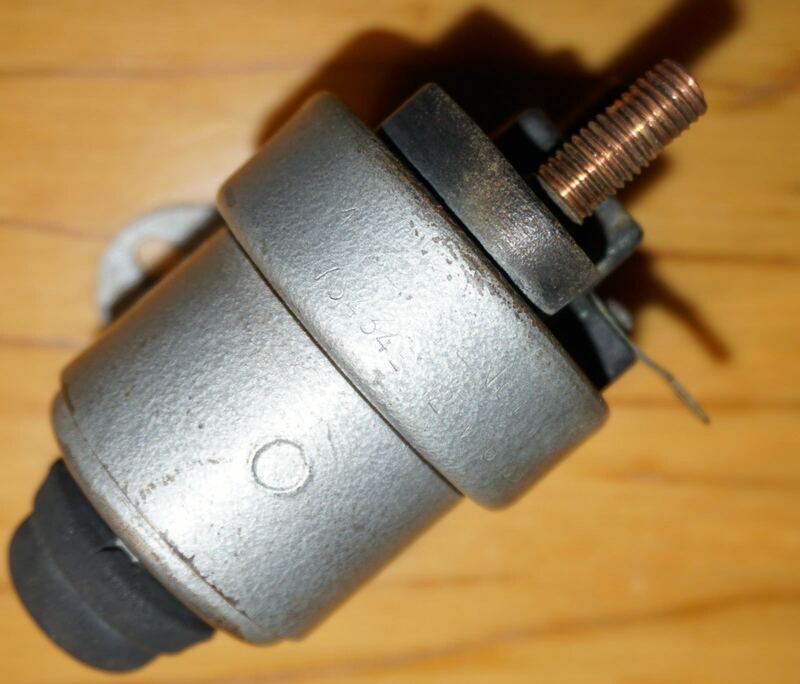 The 2ST became the in-service replacement for the ST950 solenoid. 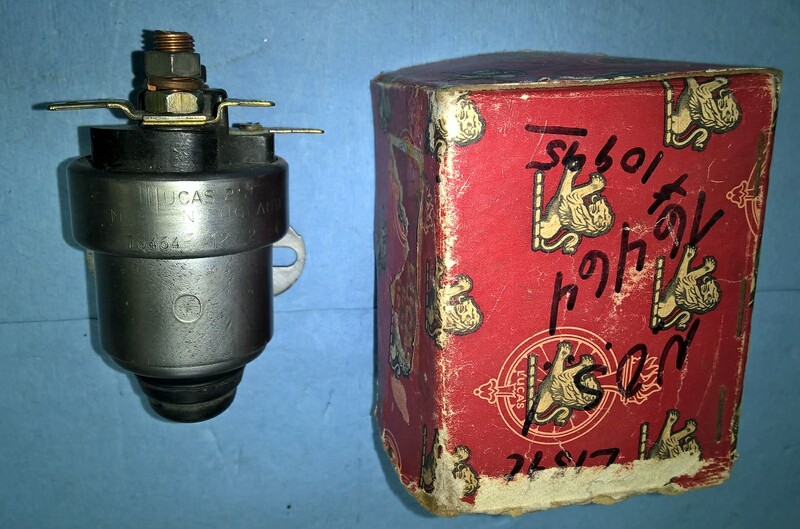 This would have been used for all in-service replacements and was physically identical to 76464 other than a redesigned rubber cap. 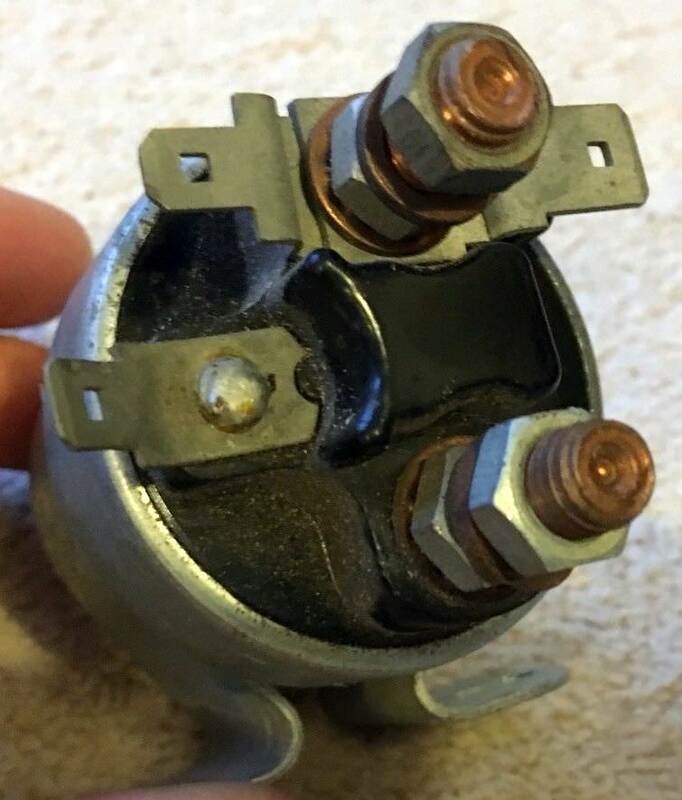 If anyone has good photos of 76465, 76464 or 76737 marked solenoids please let me have them.